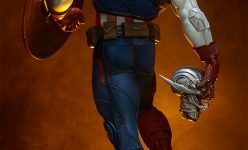 In arrivo a Settembre 2019 Gli oggetti sono preordinabili a partire da oggi seguendo il link che trovate qui sotto che vi porterà sul nostro sito ufficiale. 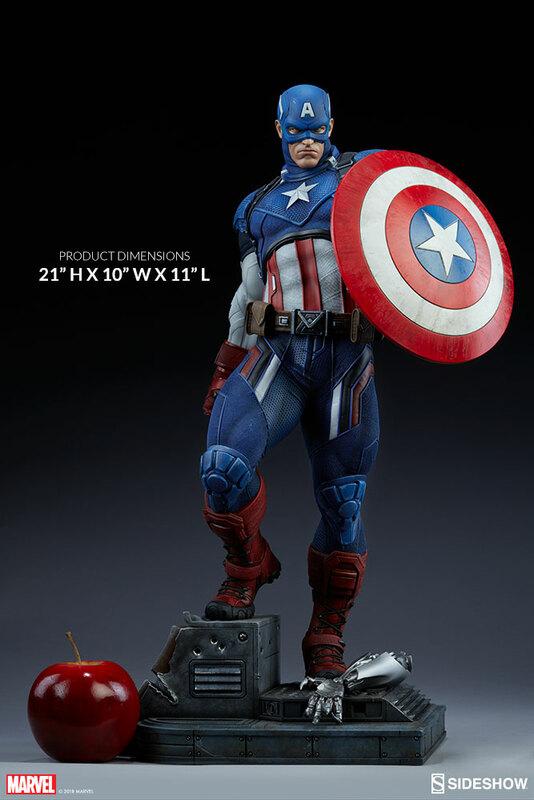 Limited to 3500 pieces worldwide. The time has come for the next evolution in ARTFX, and Kotobukiya is proud to debut the incredible ARTFX Premier Statue line. 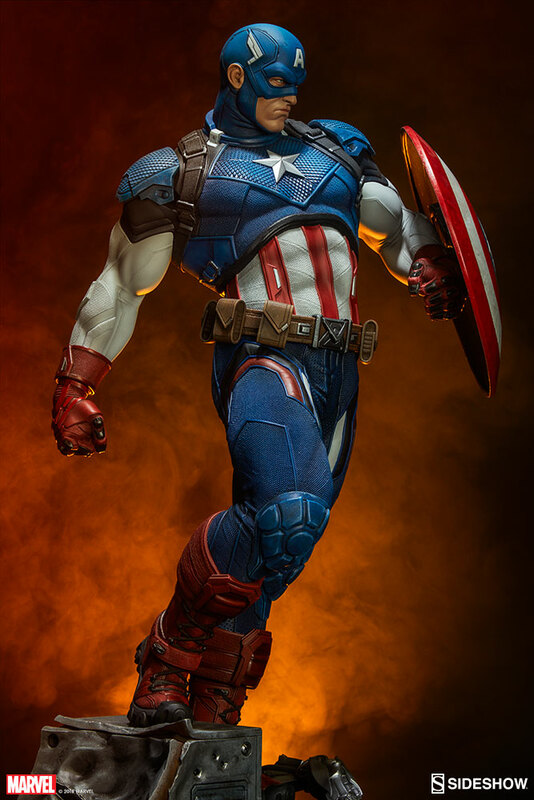 Following hot on the heels of the Asgardian Thor Odinson is the American super soldier and defender of liberty, CAPTAIN AMERICA from Marvel’s modern Fresh Start comics! 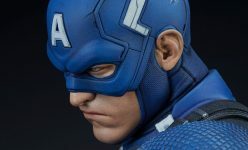 ARTFX Premier is a high-quality statue line that challenges the limits of product development by capturing characters in the highest possible level of detail, and that premier quality can be seen in every aspect of this patriotic hero. 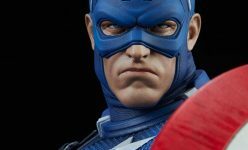 Created in 1941 by Joe Simon and Jack Kirby to represent opposition to Nazi Germany, Captain America combined superhero stories with patriotism and the fight against oppression in the world. 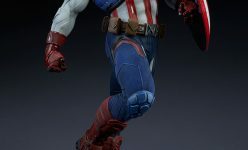 Recruited into a secret “Super-Soldier” program, Steve Rogers was given a serum and radiation that transformed him into a paragon of human athleticism. 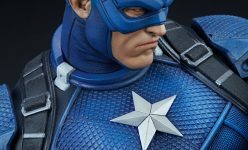 Since his introduction Captain America has been one of Marvel’s most popular characters, and his appearances in the Marvel Cinematic Universe have only strengthened that acclaim. 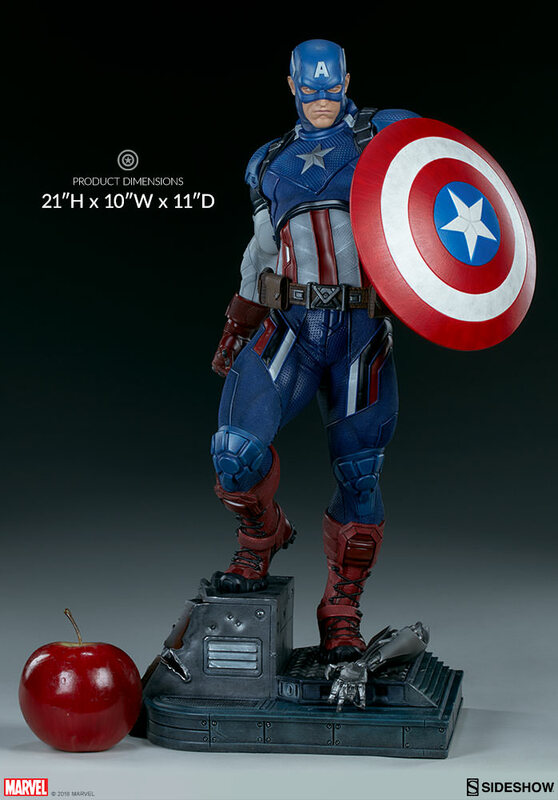 Now you can celebrate the iconic superhero with this definitive collectible! 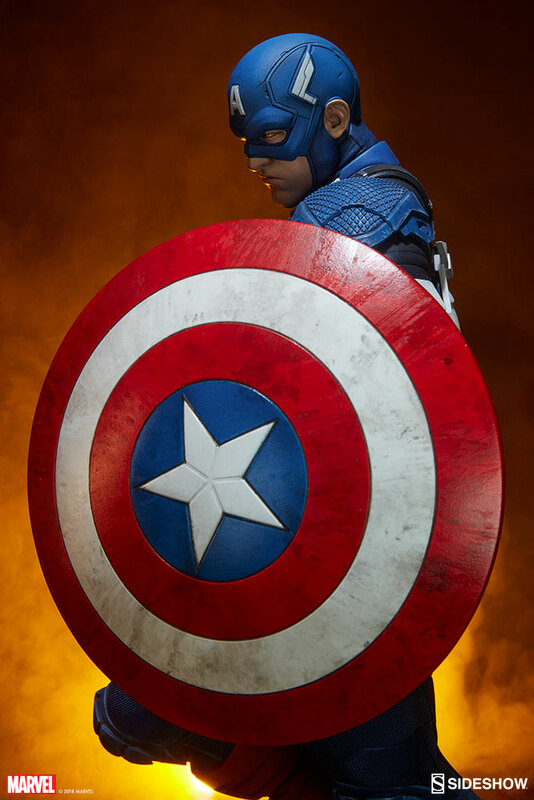 The quintessential hero standing up for what’s right, Captain America is here to protect the innocent at all costs. 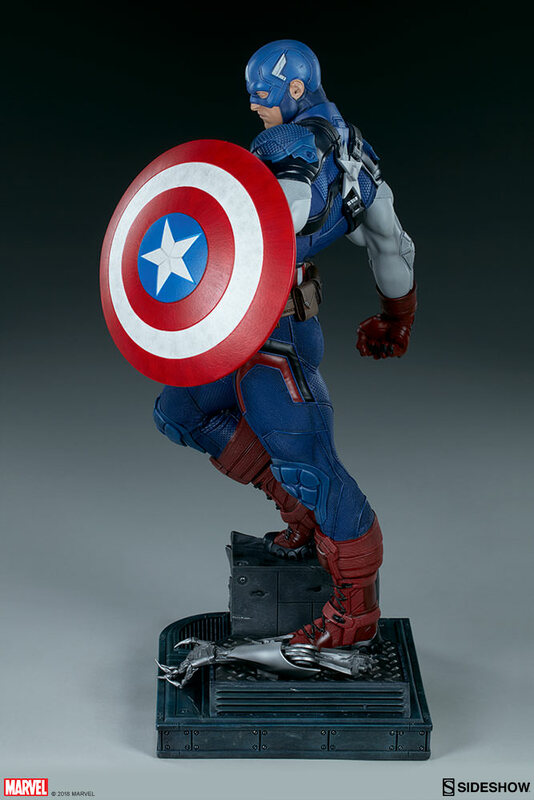 He dives into battle, leading with his shield as he traverses broken terrain at a run. 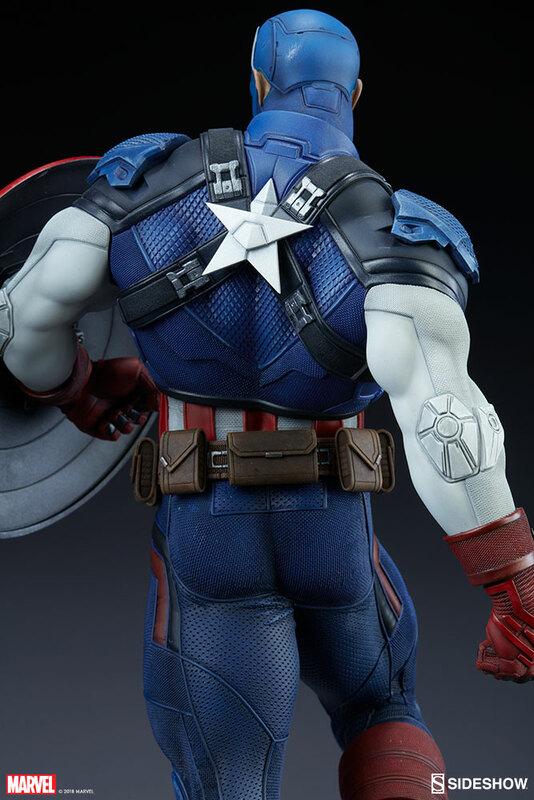 Thanks to the advanced craftsmanship incorporated into the ARTFX Premier line Captain America is rendered in glorious detail like never before with expert sculpting, injection molding techniques, and revolutionary paint applications. 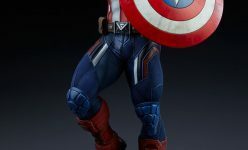 His iconic red, white, and blue costume is absolutely covered in intricate details from clothing elements like the fine grain in his shirt and trousers to seams, creases, and different textures like the hard, overlapping scales of his armored torso and the “leather” of his belt and boots. 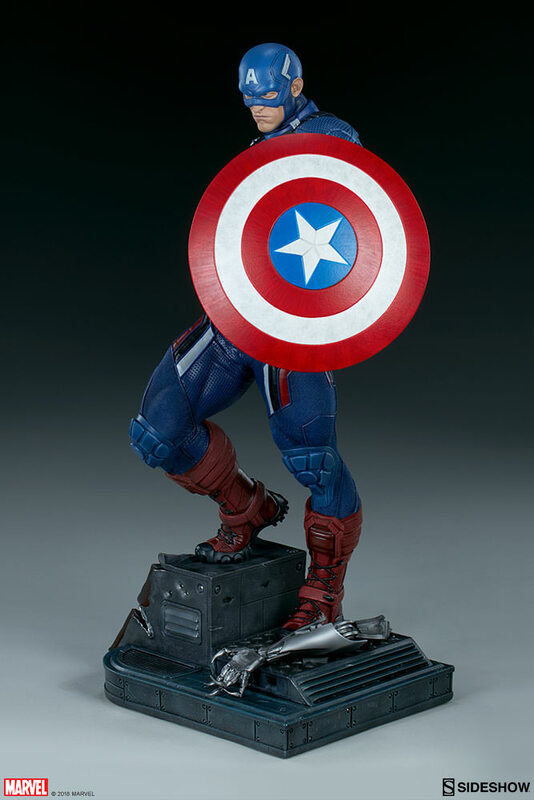 Meanwhile, Cap’s star spangled Vibranium shield looks amazing with its glossy finish. 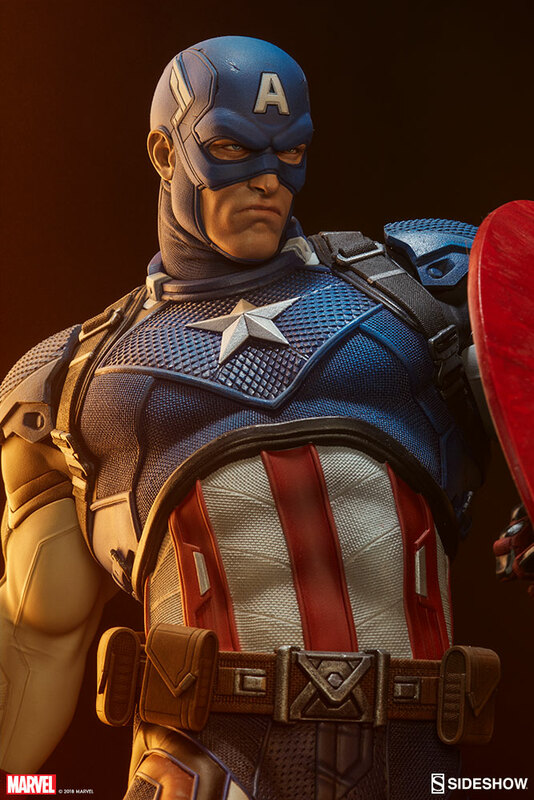 Even with all of that, Steve Rogers’ extremely lifelike facial portrait is the focus point of this presentation, and it can be enjoyed from a variety of angles thanks to expert paint application capturing photographic realism. 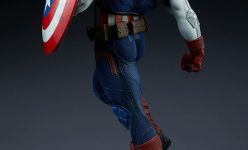 Sculpted by RESTORE, Captain America stands nearly 10 inches tall (1/10th scale) in his crouching pose on the rocky display base. 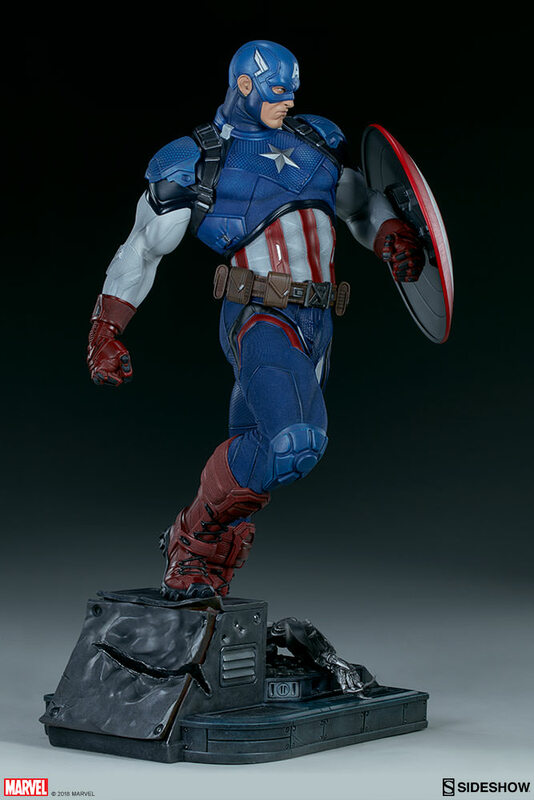 He comes to you in sophisticated packaging overflowing with detail including a marble-inspired background motif as well as an original illustration based on the figure. 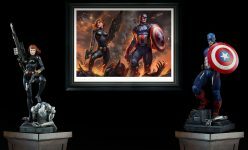 Additionally, this limited edition statue comes with a certificate with its collector number printed in gold, certifying each piece is a one-of-a-kind original. 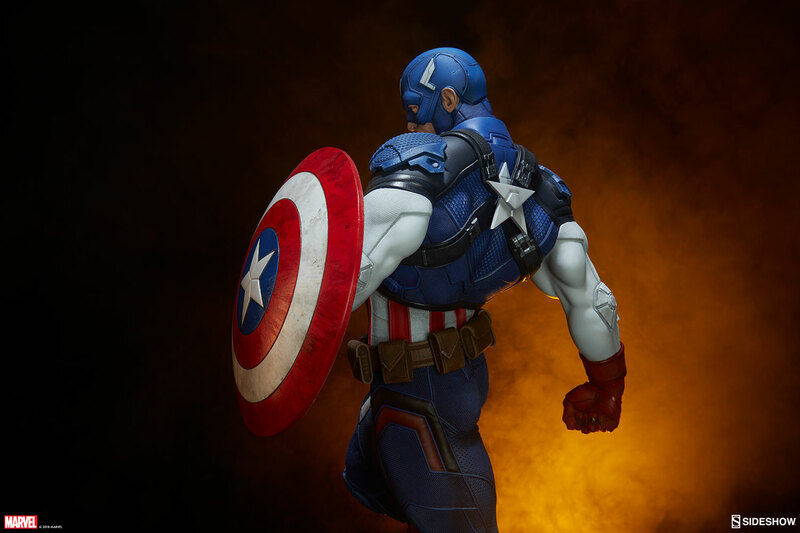 Captain America will be a beacon for freedom and a centerpiece in your collection, whether you display him by himself or alongside other heroes in the ARTFX Premier series like Thor Odinson! 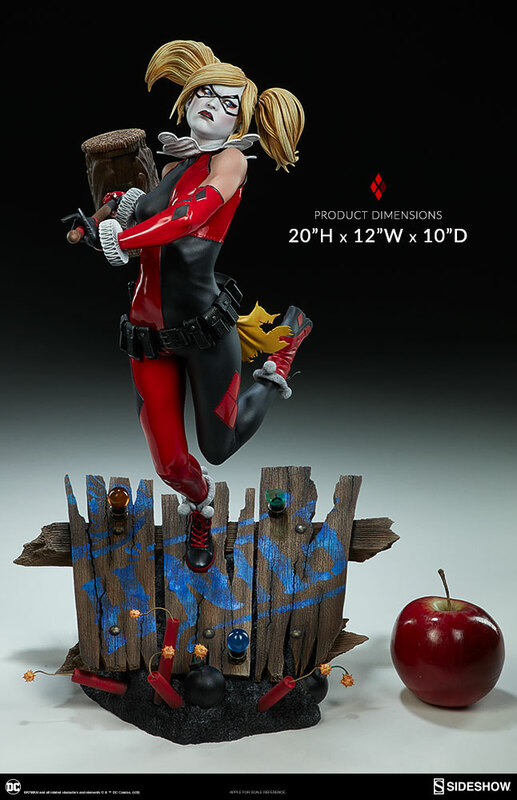 The time has come for the next evolution in ARTFX, and Kotobukiya is proud to debut the incredible ARTFX Premier Statue line starting with Marvel’s iconic hero THOR ODINSON! 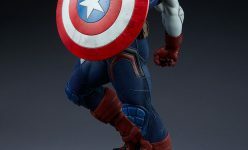 ARTFX Premier is a high-quality statue line that challenges the limits of product development by capturing characters in the highest possible level of detail, and that premier quality can be seen in every aspect of the Asgardian Avenger. 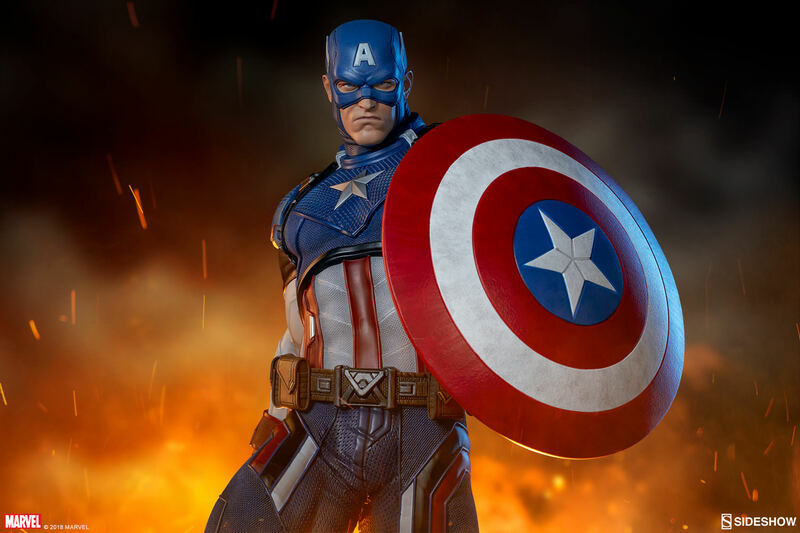 In 1962 comic book mastermind Stan Lee set out to create a new superhero, one who was incredibly powerful. 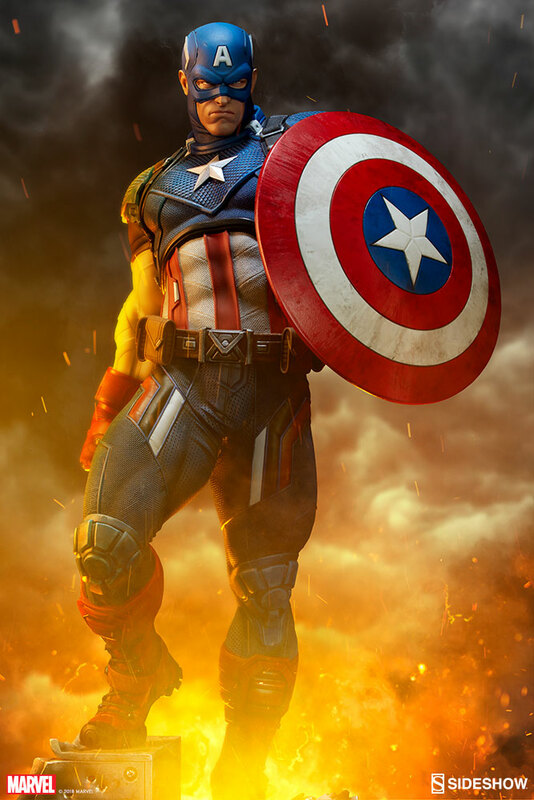 He found such a character in Norse mythology with the god of thunder. 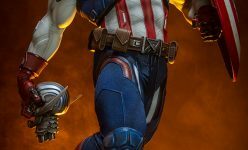 A true champion of good, Thor has fought beside many other Marvel Comics superheroes throughout the years, including several incarnations of the Avengers. 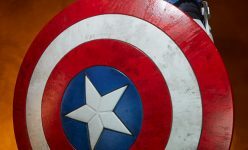 He has even starred in three feature films as well as the ensemble Avengers movies! 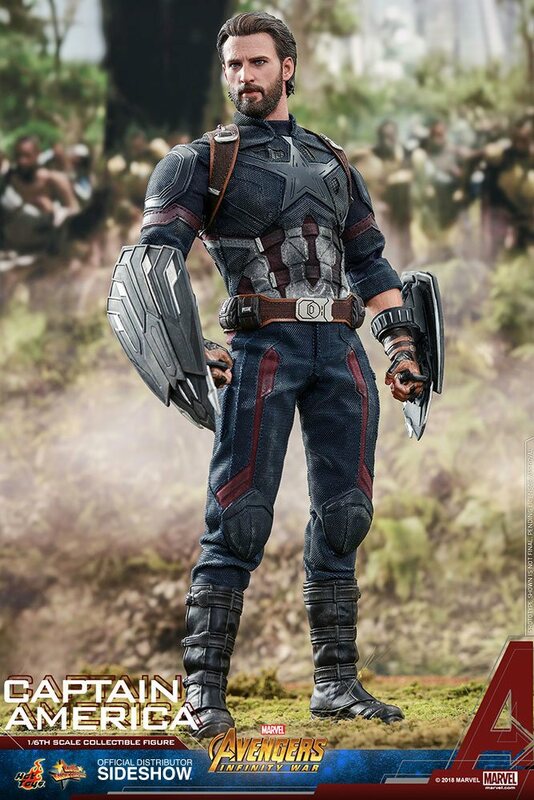 Thor Odinson has arrived to take on the biggest threats to the mortal realms, and to win some glory at the same time. 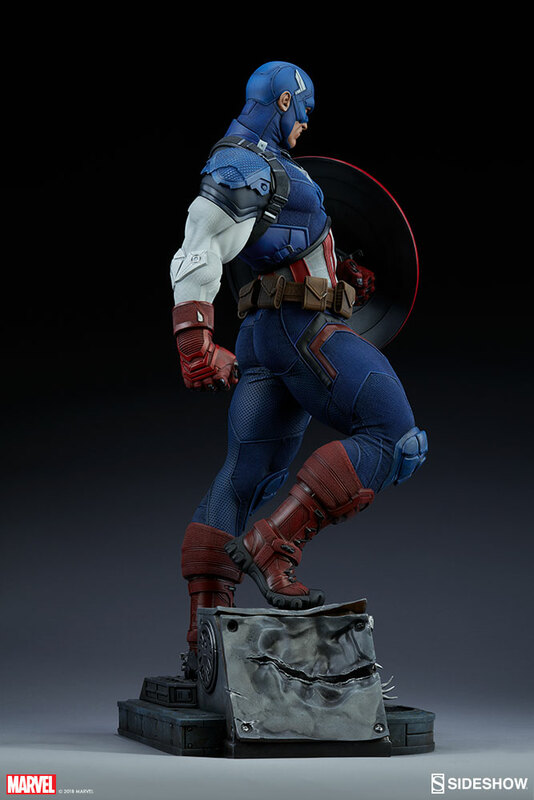 He stands triumphant upon a rocky display base, one foot resting on an outcropping as he raises his mighty hammer Mjolnir into the air above him! 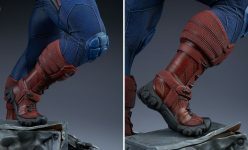 This magnificent 1/10 scale Thor Odinson was crafted using digital sculpting, emphasizing his heroic appearance alongside incredibly lifelike detail. 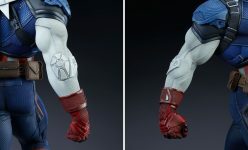 From the sculpt to the paint application, achieved through the ARTFX Premier line’s enhanced process of layering with multiple shades, every detail of the thunder god is brought to life with an unprecedented sense of beauty and depth. 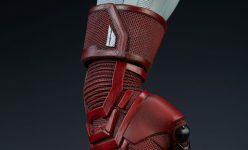 Part of the design creation even involved imagining what kind of materials might be used for clothing and armor in the realms of Asgard, and that informed the styling of Thor’s unique metal and leather outfit along with the colors that change and shimmer depending on the angle of the viewer. 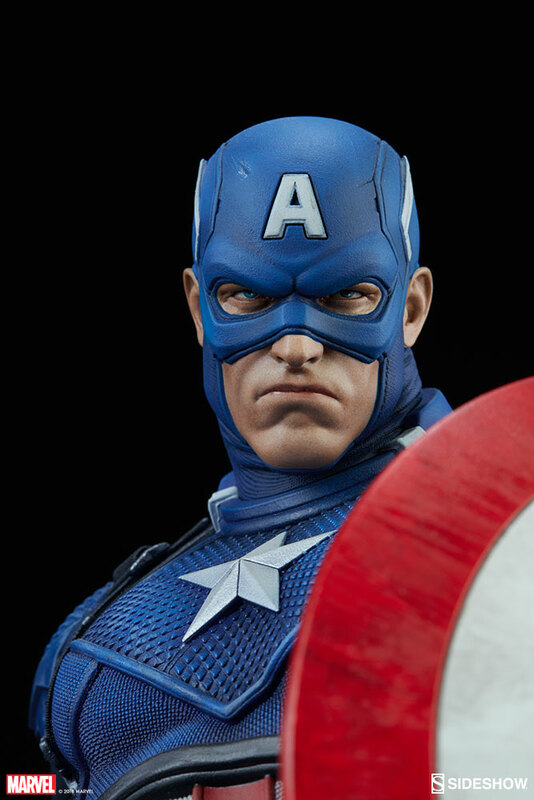 Meanwhile, the Avenger’s face is captured in a triumphant expression, meticulously crafted with lifelike detail. 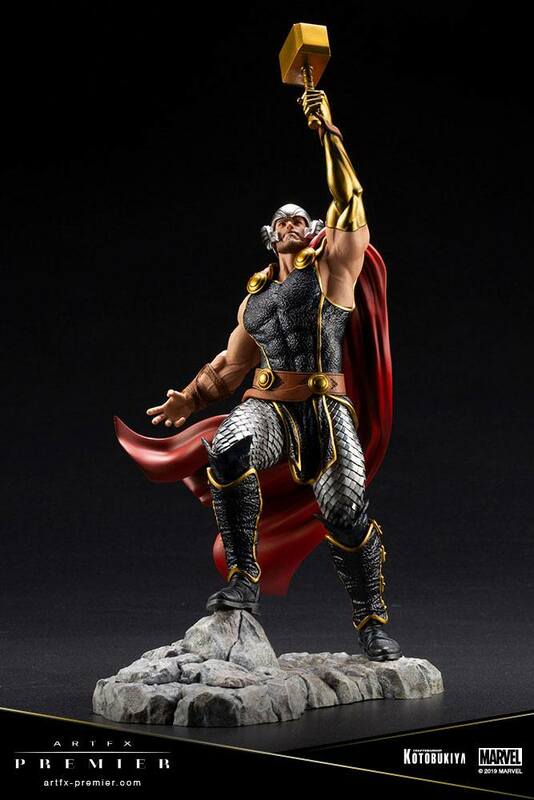 Sculpted by Keita Misonou, Thor Odinson stands nearly 12 inches tall (1/10th scale) atop his rocky display. 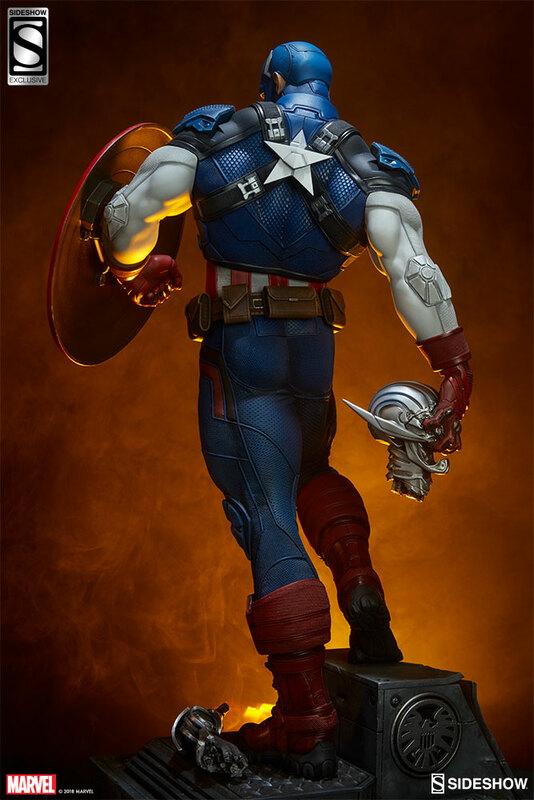 He comes to you in sophisticated packaging overflowing with detail including a marble-inspired background motif as well as an original illustration based on the figure. 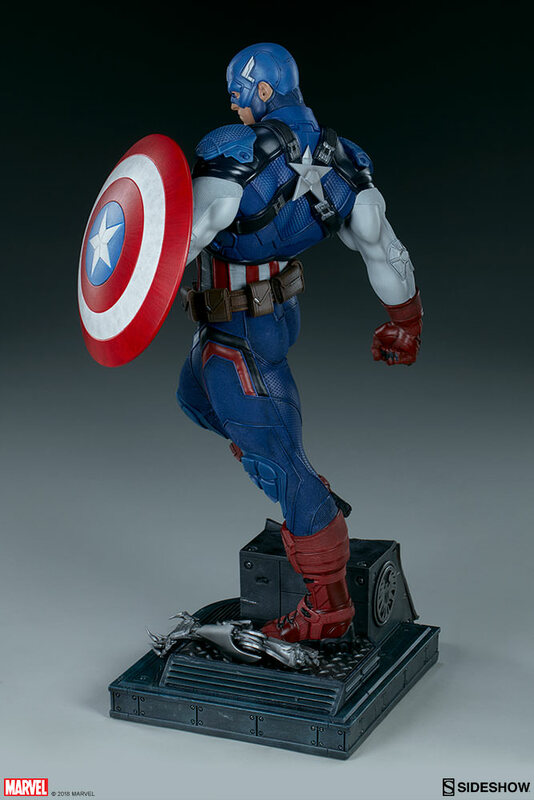 Additionally, this limited edition statue comes with a certificate with its collector number printed in gold, certifying each piece is a one-of-a-kind original. 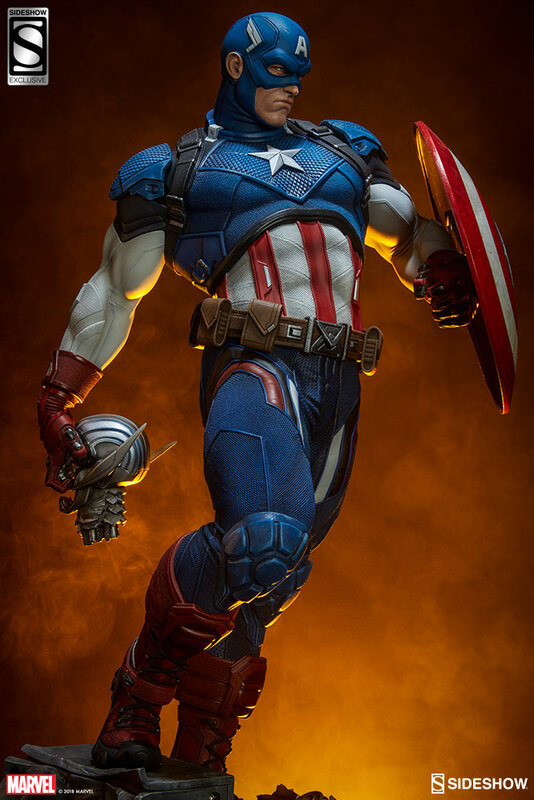 This stunning rendition of Thor Odinson is sure to make your collection shine, and he is the perfect jumping off point for the new ARTFX Premier series! 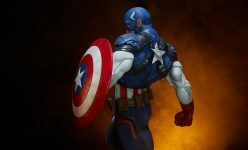 Tutti gli oggetti presentati in questa pagina: – Kotobukiya – 1/10 ARTFX Premier Statues – Thor & Captain America – sono disponibili per ordini o preordini presso la Fumetteria Inchiostro & Tempera di Napoli. 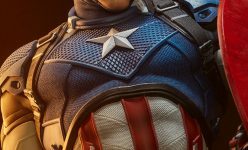 In arrivo a Gennaio/Settembre 2019 Gli oggetti sono preordinabili a partire da oggi seguendo il link che trovate qui sotto che vi porterà sul nostro sito ufficiale. 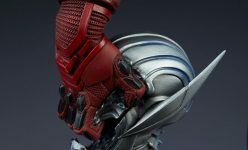 When the Jurassic World: Fallen Kingdom trailer first premiered, the scene that probably caught your eye the most was the flashback sequence involving Blue and Owen when Blue was barely a hatchling. 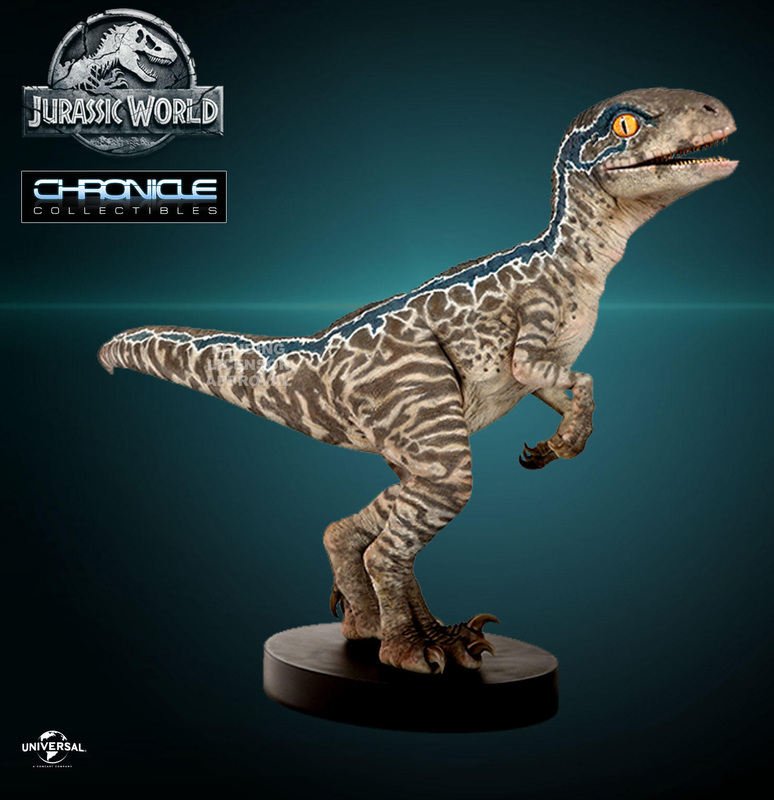 Blue has arguably been the fan favorite of the new Jurassic World franchise, and a favorite of the team at Chronicle Collectibles as well. So, it gives us great pleasure to present our first collectible from Jurassic World: Fallen Kingdom – 1:1 Baby Blue. 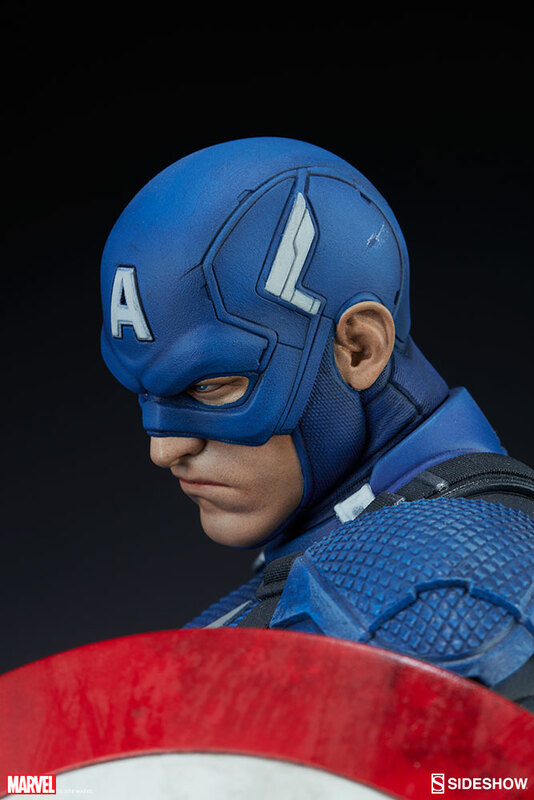 This life-size statue of Baby Blue was made using the same digital files from Industrial Light & Magic as you see in the film, making this the most screen-accurate Baby Blue you will ever find. 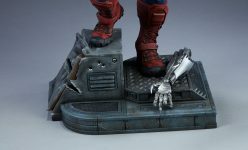 This 1:1 scale statue will surely make for a show-stopping centerpiece to any Jurassic Park fan’s collection and will be instantly recognizable to your guests, co-workers, friends, and family. 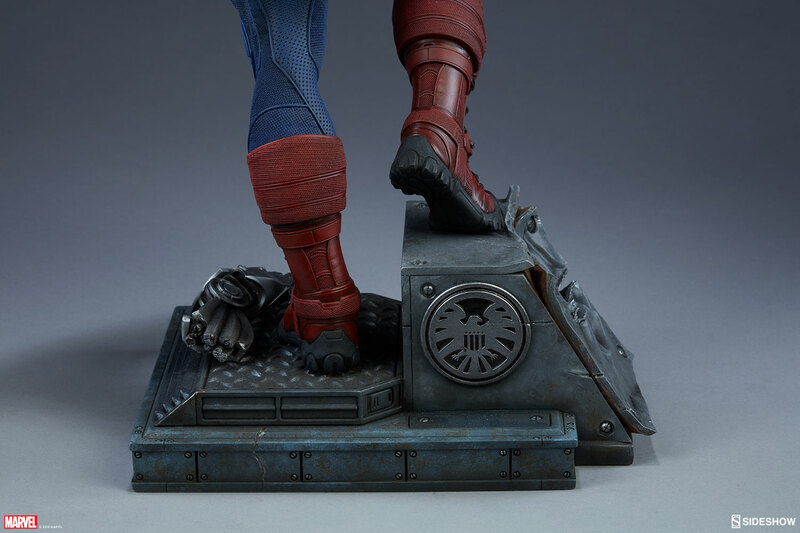 In other words, pretty much anyone who ventures out to the megaplex to see this summer’s hottest blockbuster will know exactly what you have and you’ll be the absolute envy of them. 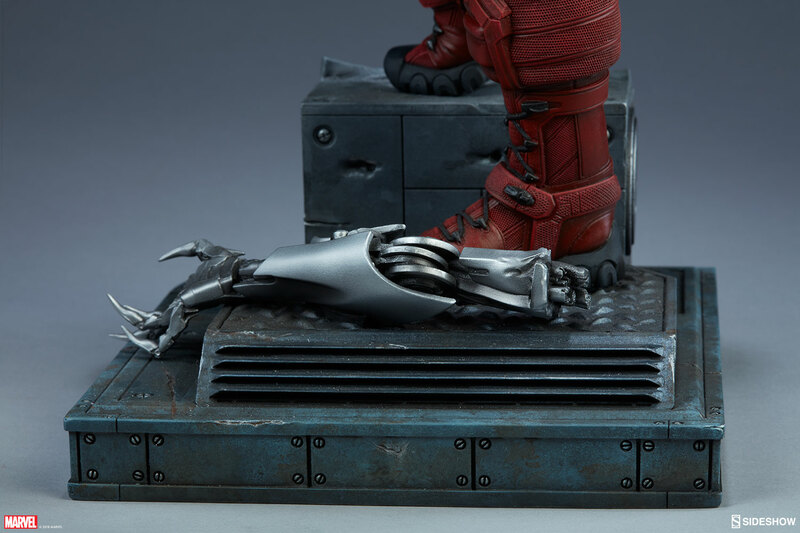 Discover the fun you’re going to have with this statue as you recreate the scene where Owen plays with Baby Blue. 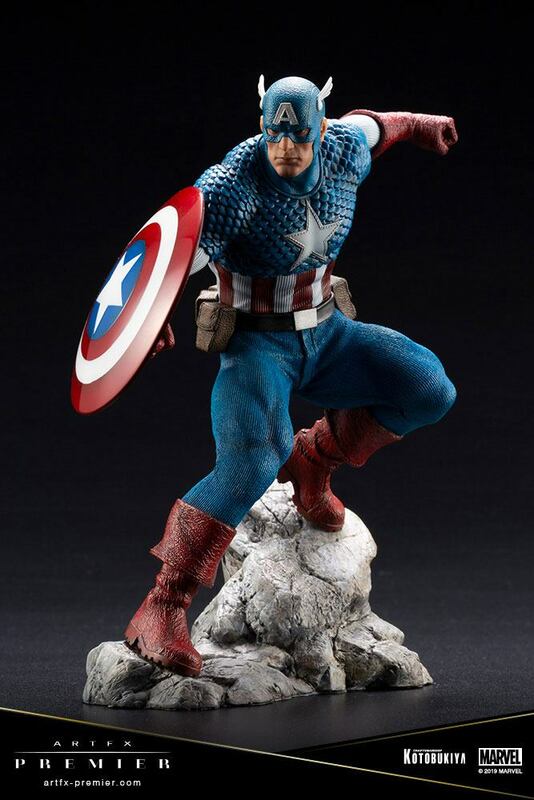 We fully anticipate lots of pictures will pop up on social media of fans posing with our 1:1 Baby Blue statue in a variety of settings, limited only by fan creativity. Don’t miss this chance to bring Baby Blue home to your collection! 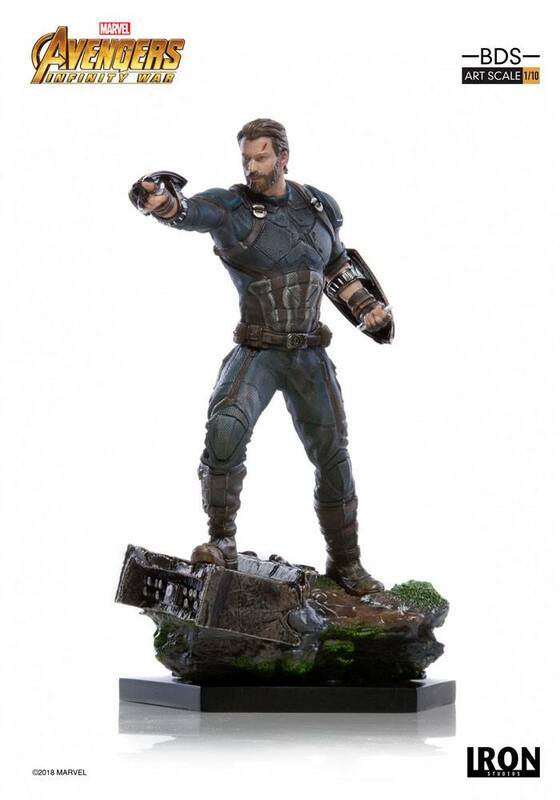 Straight from the Marvel Blockbuster “Avengers: Infinity War” comes this 1/10th scale statue! 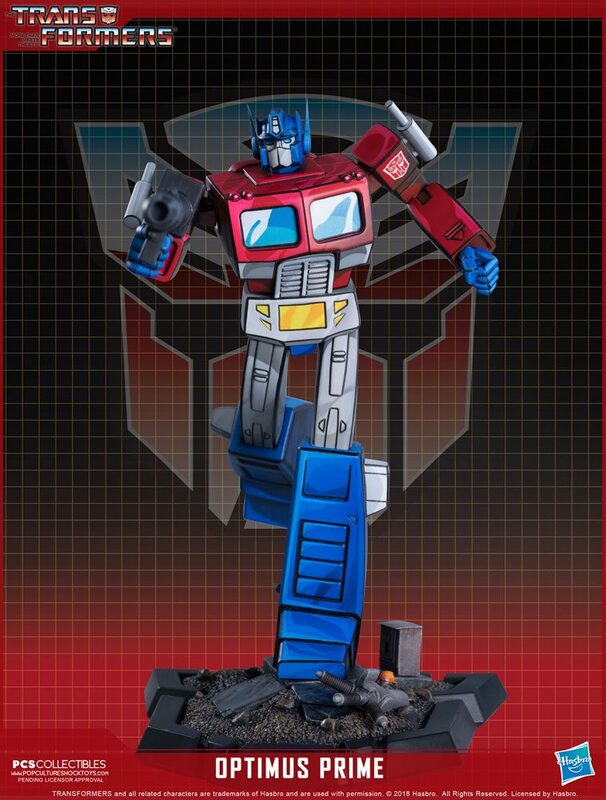 PCS Collectibles is proud to present the OPTIMUS PRIME “Classic” Scale Statue. 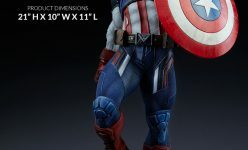 The first in a line of all new collectibles depicting the AUTOBOTS and DECEPTICONS as they first appeared in the classic animated series THE TRANSFORMERS, this line will feature meticulously detailed paint applications to recreate the look of the animated series as it’s never been done before. 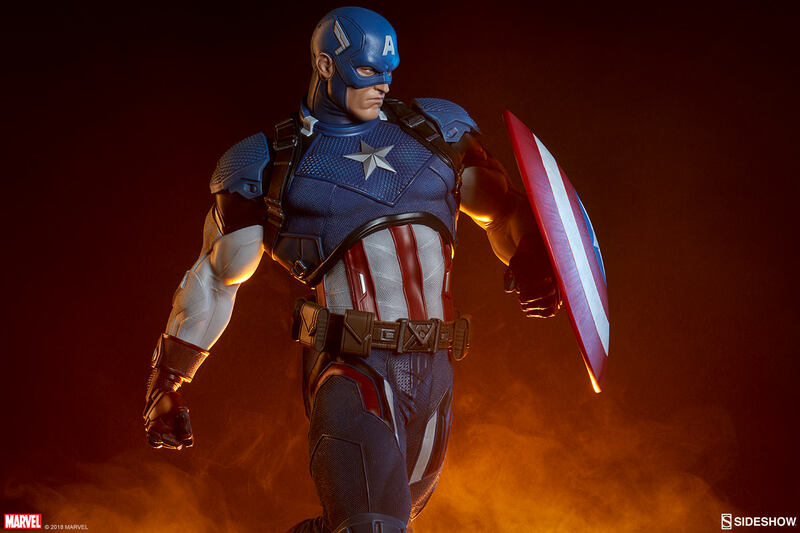 Tutti gli oggetti presentati in questa pagina: – Jurassic World Baby Blue – PCS Transformers Optimus Prime – Avengers Infinity War Captain America Statues – sono disponibili per ordini o preordini presso la Fumetteria Inchiostro & Tempera di Napoli. 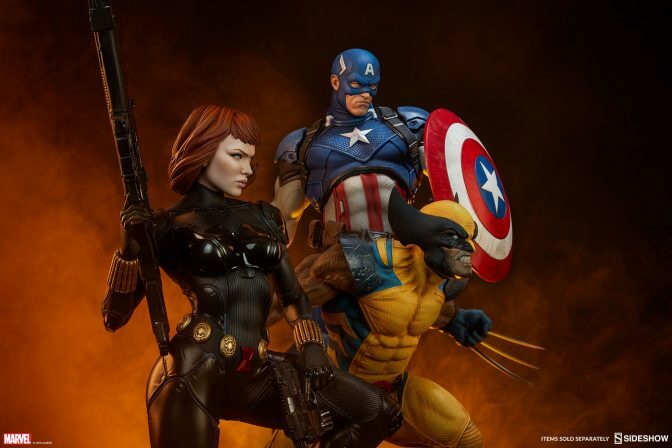 In arrivo a Novembre 2018/Giugno 2019. 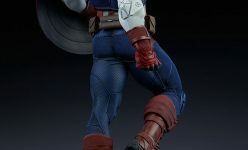 Gli oggetti sono preordinabili a partire da oggi seguendo il link che trovate qui sotto che vi porterà sul nostro sito ufficiale. Luke Skywalker™ used the power of The Force™ and his piloting skills to destroy the Death Star under the call sign of “Red Five” during the Battle of Yavin™. 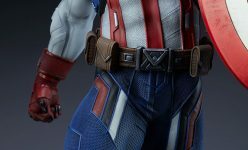 – This accessory includes details recreated from 3D scans, measurements, and reference taken from original screen-used production assets. 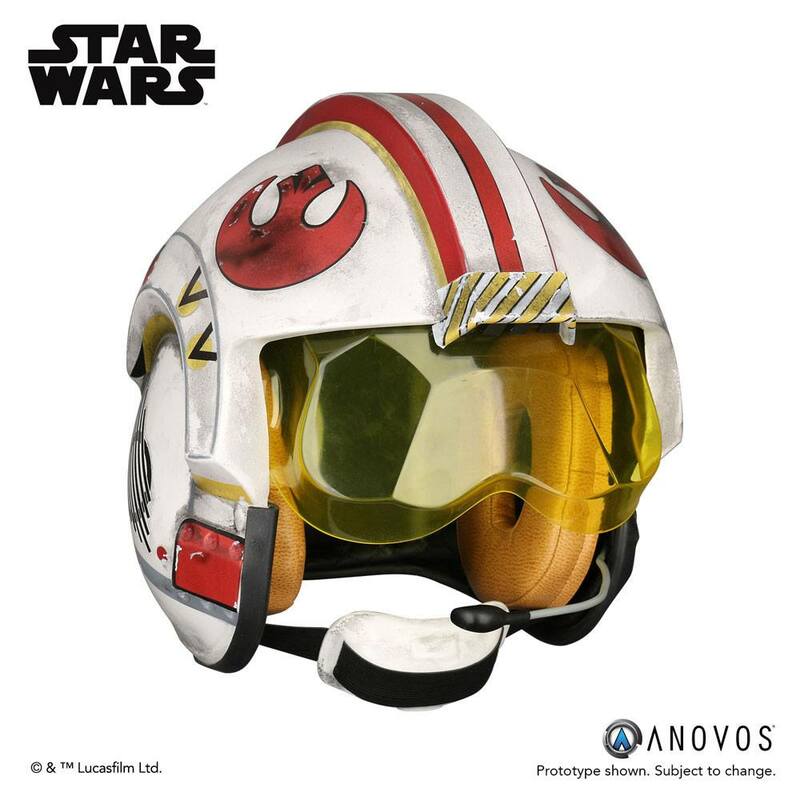 – The helmet is assembled and ready to wear with weathered finish and Red Squadron markings. 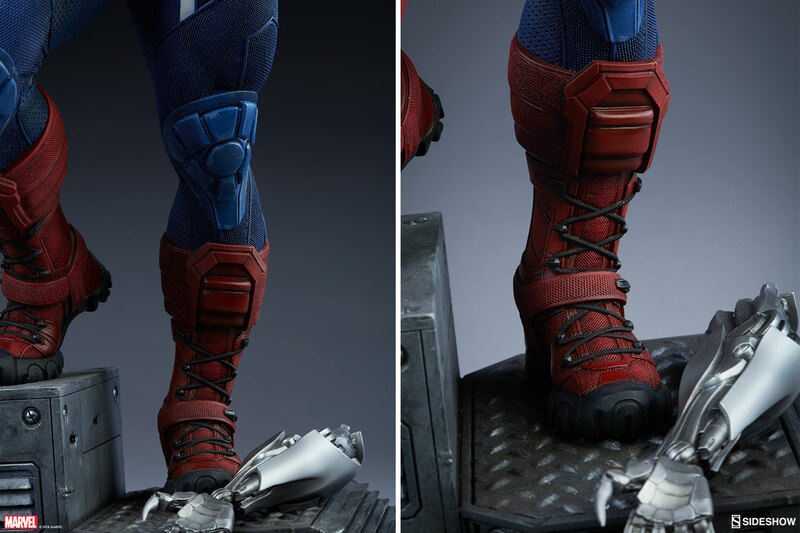 – The helmet was digitally scanned for exacting reproduction. 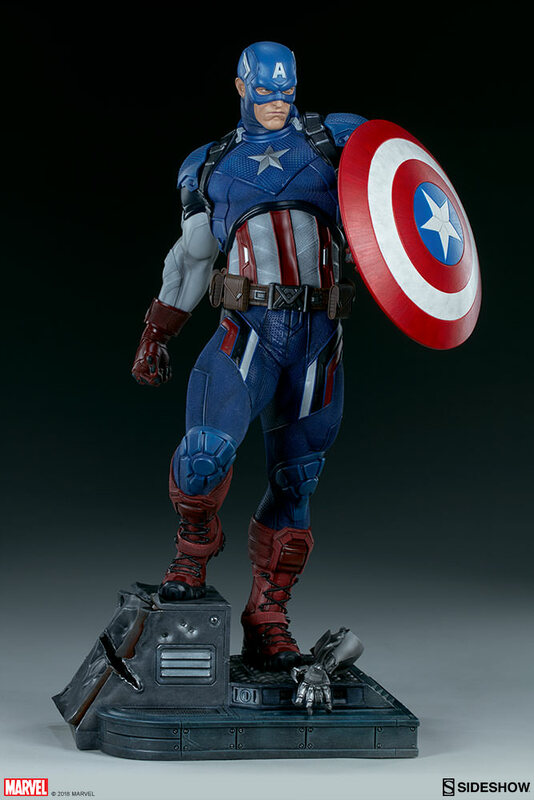 – The outer shell is made of ABS plastic and painted to duplicate the look of the original asset. Helmet interior is fully lined for a finished appearance including comlink boom and earcup cushions. 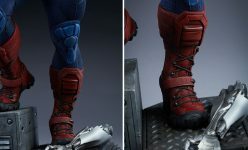 – Helmet size adjustment system ensures a comfortable and secure fit. 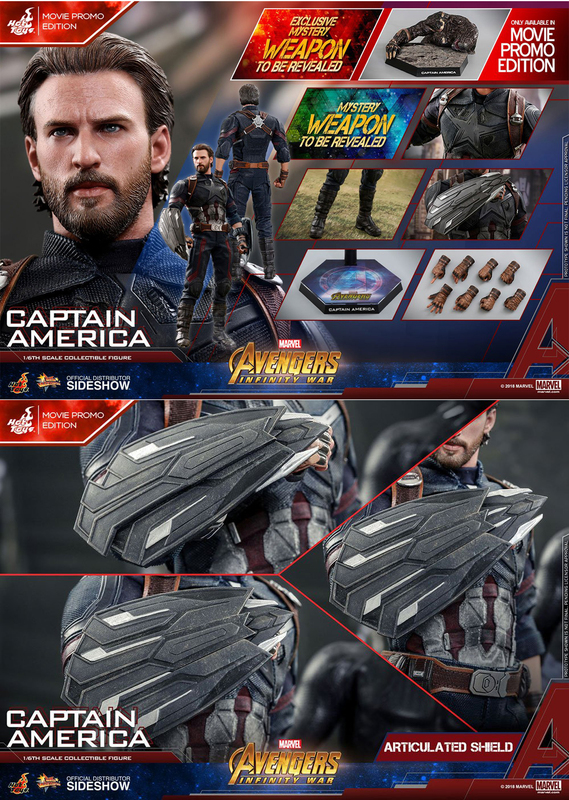 Please note that most ANOVOS helmets fit up to a size 8 US hat size. 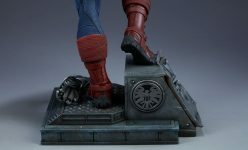 Infinity War 12″ Captain America Movie Promo Ed. 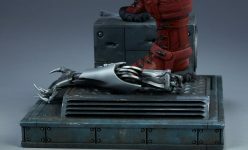 The very special movie promo edition of the figure will feature a highly detailed Outrider diorama which can be attached to the figure stand, and an additional exclusive mystery weapon to be revealed after the movie release. 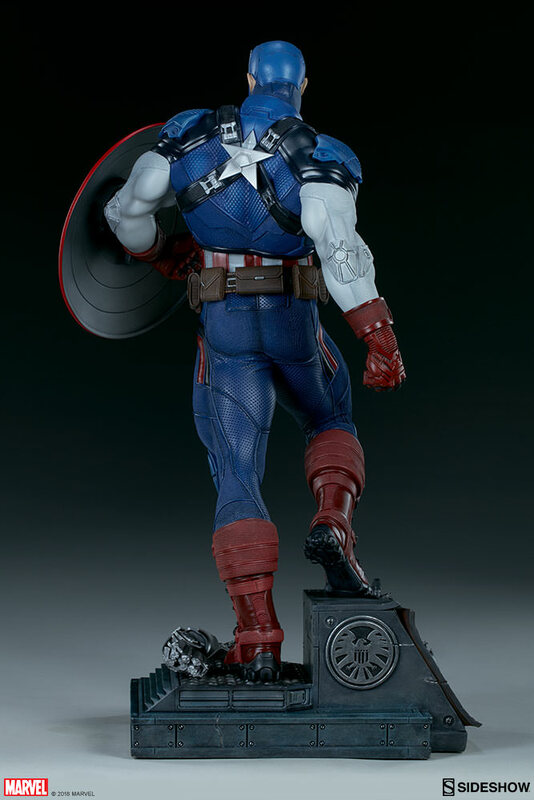 This stylish and extraordinary interpretation of the Captain America figure is a unique collectible for fans and collectors. 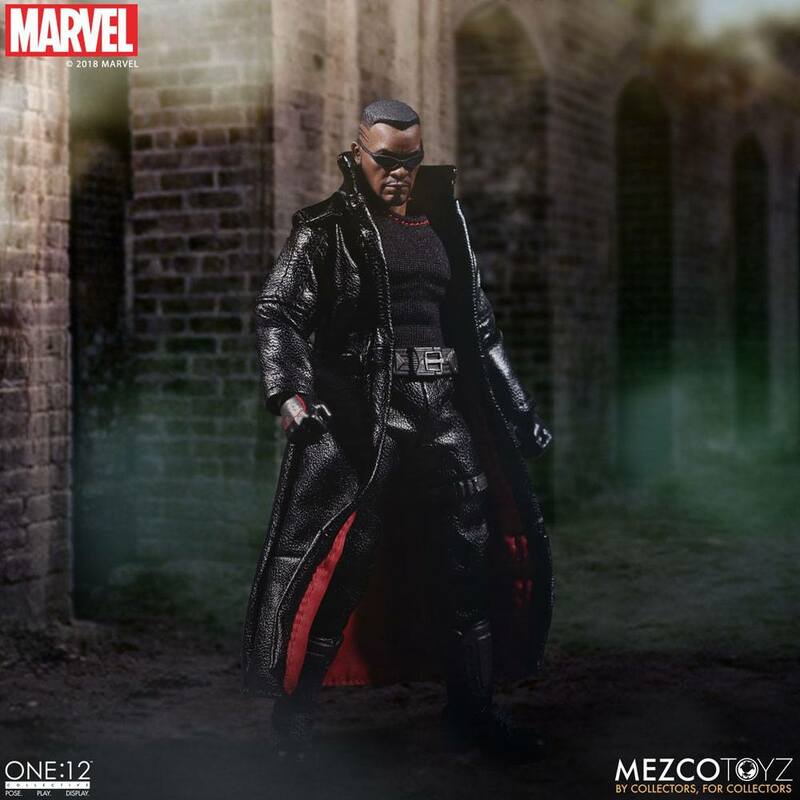 Tutti gli oggetti presentati in questa pagina: – Mezco – Blade + Luke Skywalker Rebel Helmet + Hot Toys Captain America Movie Promo – sono disponibili per ordini o preordini presso la Fumetteria Inchiostro & Tempera di Napoli. 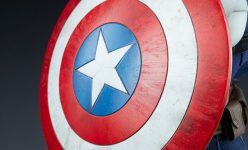 In arrivo a Giugno 2019. 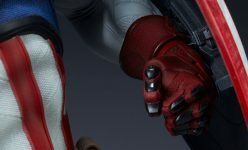 Gli oggetti sono preordinabili a partire da oggi seguendo il link che trovate qui sotto che vi porterà sul nostro sito ufficiale. 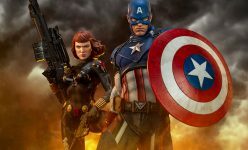 Tutti gli oggetti presentati in questa pagina: – Hot Toys – Avengers Infinity War 1/6 Captain America – sono disponibili per ordini o preordini presso la Fumetteria Inchiostro & Tempera di Napoli. 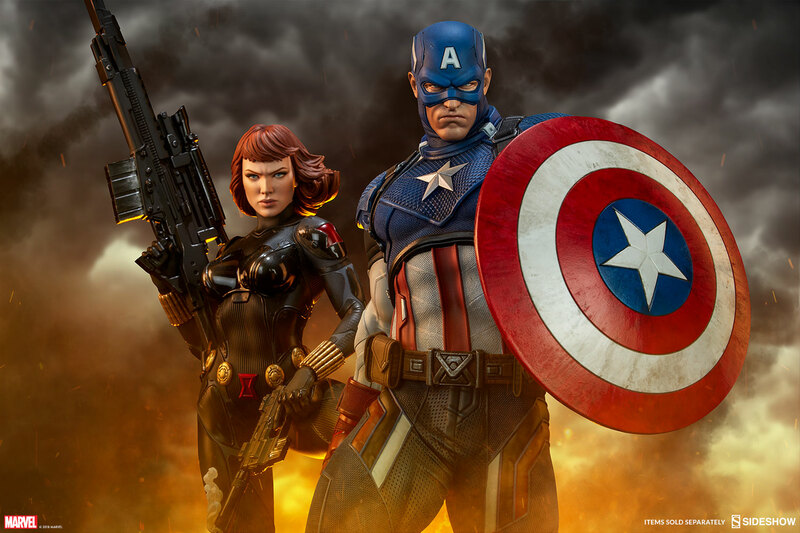 In arrivo a Febbraio/Agosto 2019. 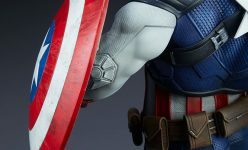 Gli oggetti sono preordinabili a partire da oggi seguendo il link che trovate qui sotto che vi porterà sul nostro sito ufficiale. 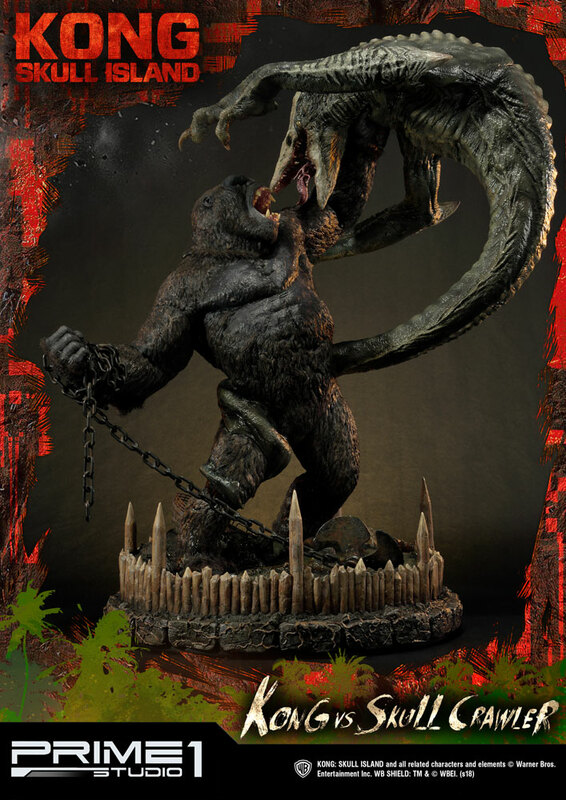 Prime 1 Studio is proud to present UDMKG-01: Kong Vs Skull Crawler from Kong: Skull Island (Film). Kong: Skull Island is a 2017 film co-produced by Legendary Pictures and Warner Bros. that serves as an origin story for King Kong. 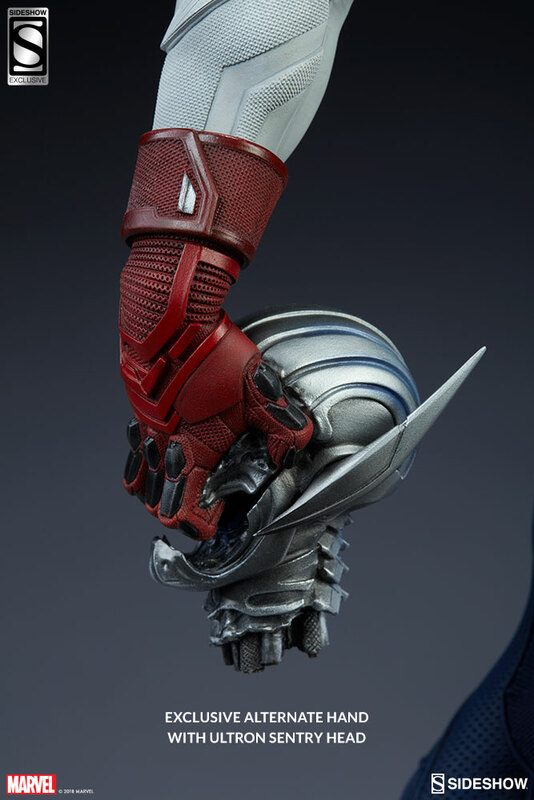 It is the second entry in the Monster Verse, following 2014’s Godzilla, and will be followed by 2019’s Godzilla: King of the Monsters, before culminating with 2020’s Godzilla vs. Kong. Set in 1973, the film follows a team of scientists and a US Army unit recently withdrawn from the Vietnam War who travel to an uncharted island in the Pacific and encounter terrifying creatures and the mighty Kong. 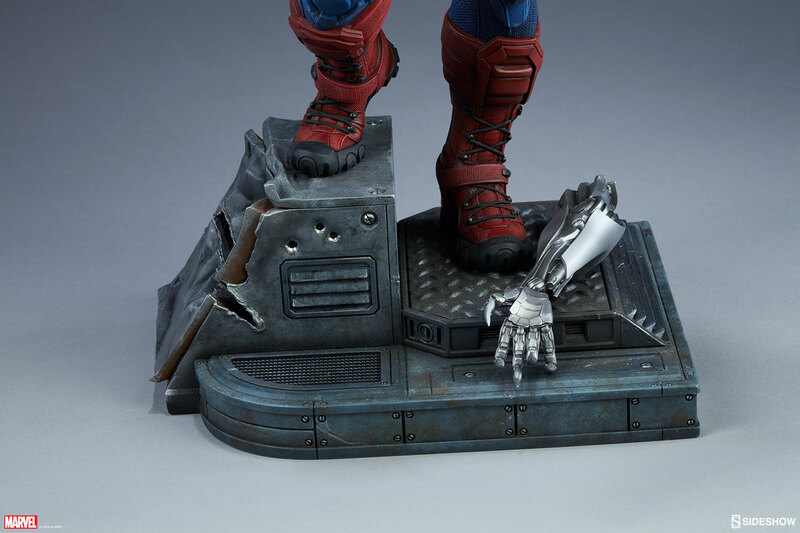 The diorama represents one of the most epic fighting scenes of the film with the Skull Crawler clinging on Kong. Prime 1 Studio and CD PROKET RED are proud to present PMW3-03: Ciri of Cintra from The Witcher 3: Wild Hunt. 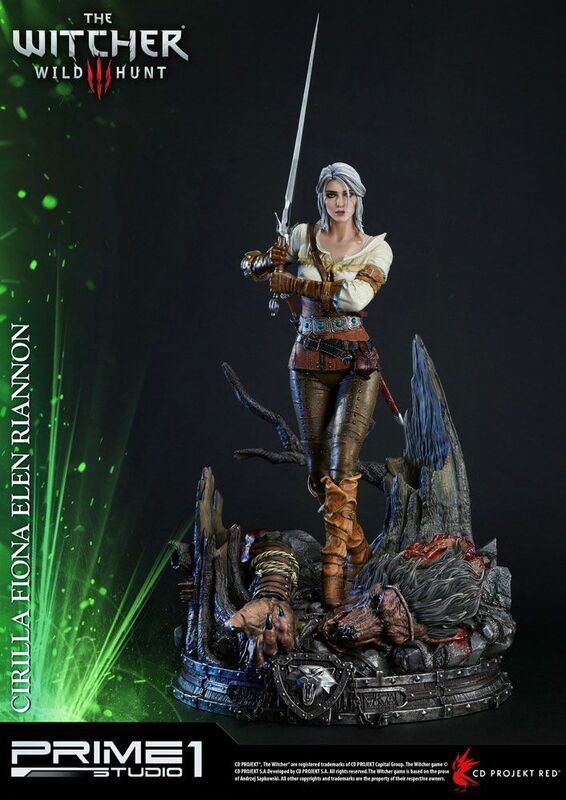 Cirilla Fiona Elen Riannon also known as Ciri, is the deuteragonist and lead heroine of The Witcher franchise. She’s a princess of Cintra and the daughter of Pavetta and Duny, which was an alias used by Emhyr var Emreis, the emperor of Nilfgaard, as well as the adopted daughter of Geralt of Rivia and Yennefer of Vengerberg. Throughout the game, Ciri is being chased by The Wild Hunt led by Eredin, King of the Wild Hunt who wants to harness the power of of Elder Blood running through Ciri’s veins to cause the Conjunction of Spheres to bring the Aen Elle elves into the world of humans. She notably becomes playable multiple times throughout The Witcher 3, making her the only other playable character in the games other than Geralt himself. On his command! 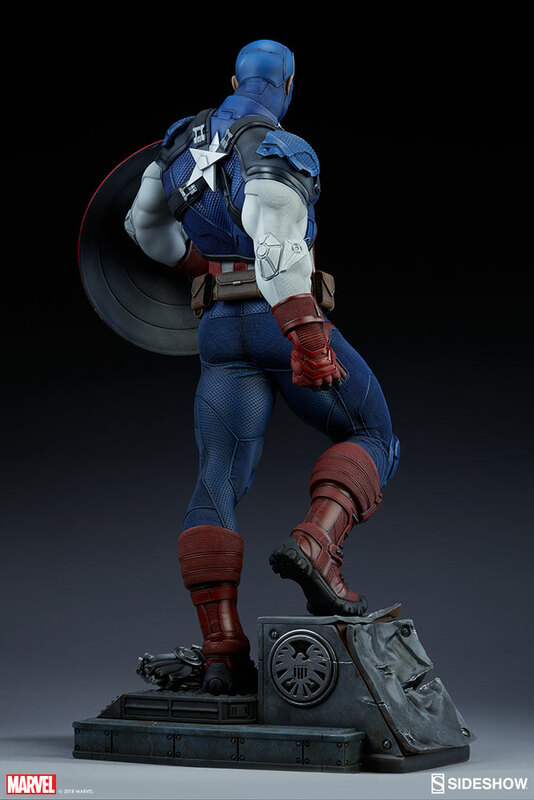 Sideshow is proud to present the Captain America Premium Format™ Figure. 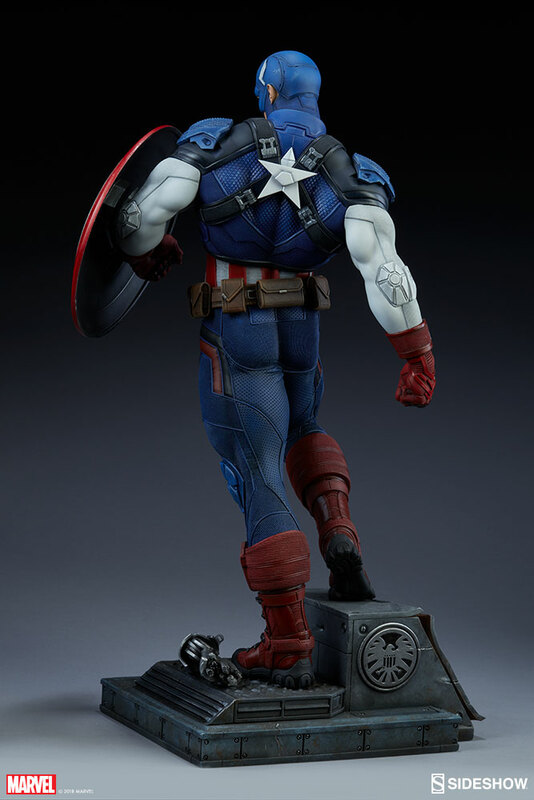 The Captain America Premium Format Figure measures 21” tall on top of a SHIELD Helicarrier platform, with a discarded Ultron Sentry arm littering the base beneath his red combat boots. 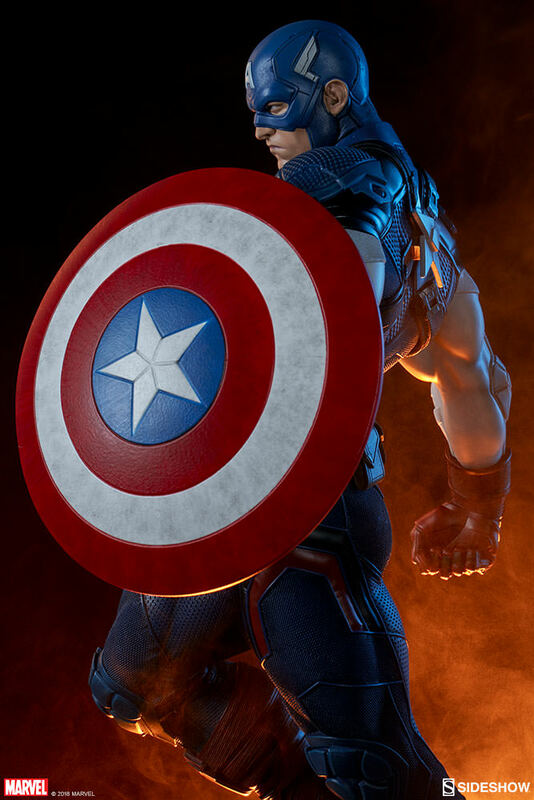 Cap’s iconic shield is raised and battle-worn while he takes a stand against Ultron and his armies. 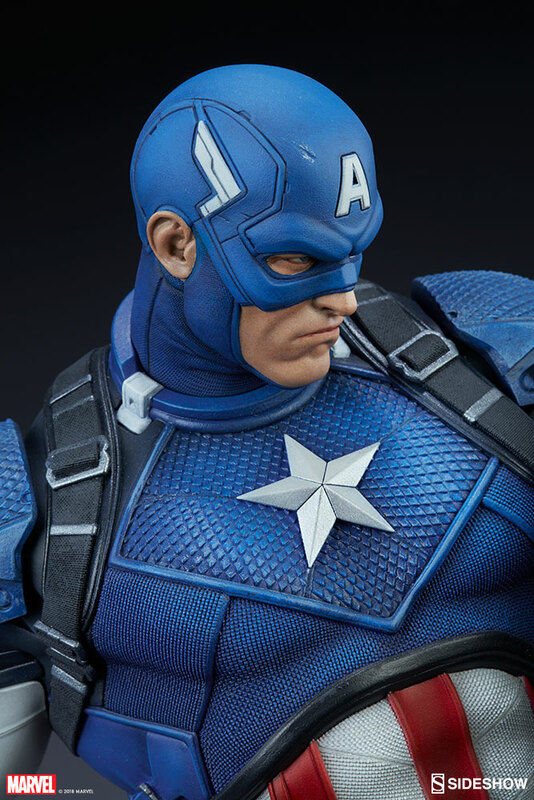 Captain America has a sculpted portrait inspired by his comic book appearance, wearing a blue helmet with slight battle damages. 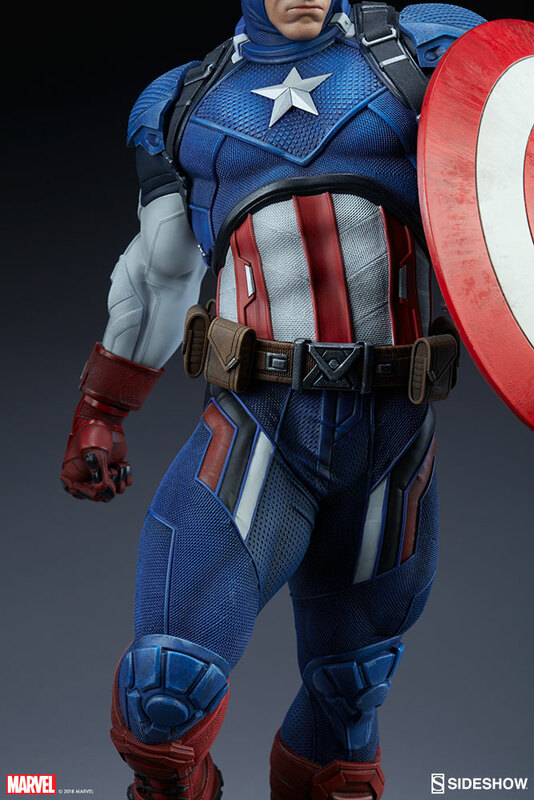 His white helmet wings and traditional ‘A’ are inset in the helmet’s sleek design as Captain America looks on with stern determination. 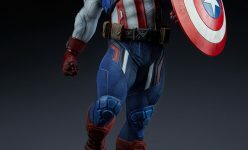 Captain America’s uniform has classic red, white, and blue details, with an upgraded aesthetic featuring tactical armor for the patriotic Avenger. 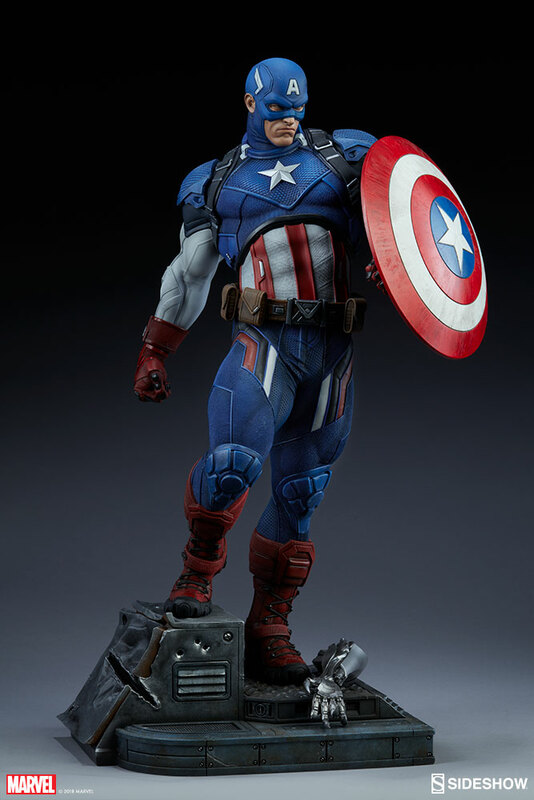 This polyresin figure has an entirely sculpted costume detailed with intricate textures and piping to simulate a difference in materials. 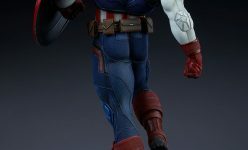 His chest bears a star symbol, and armor straps across his shoulders add a second star to the super soldier’s uniform. 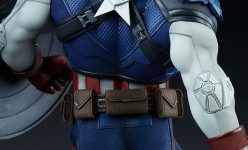 Black accents and a brown sculpted utility belt enhance the hero’s famous look. 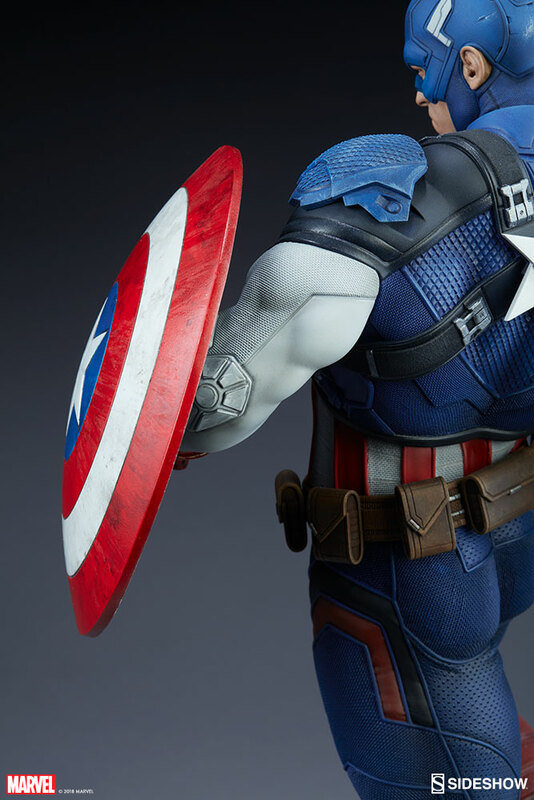 A robotic menace is no match for the strength of Captain America. 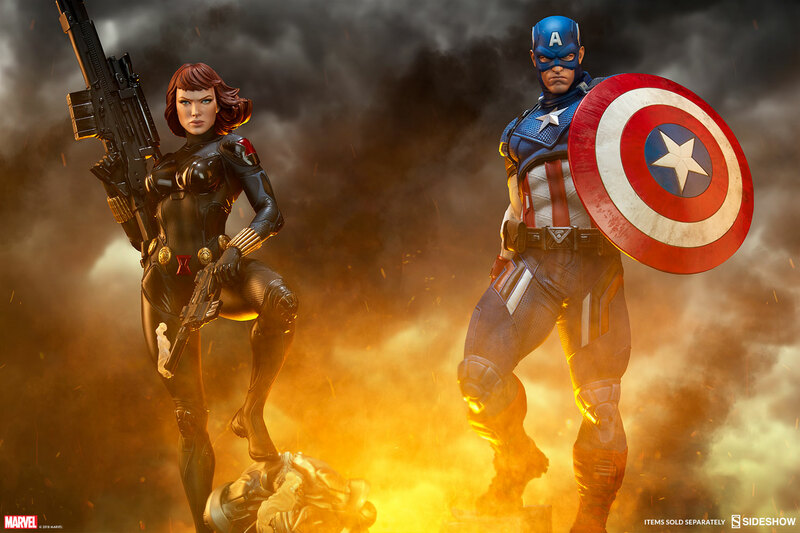 For an even more dramatic display, pair the Captain America and Black Widow Premium Format™ Figures with the Captain America and Black Widow Premium Art Print by Alex Pascenko and Ian MacDonald. 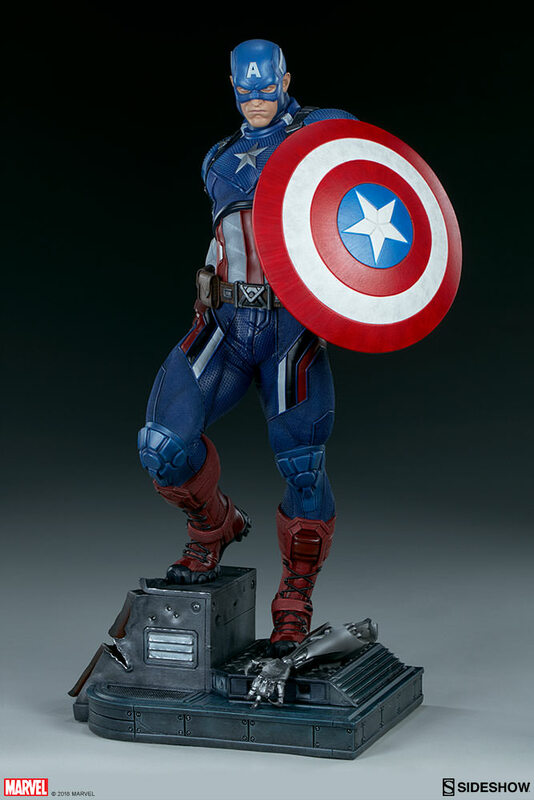 Shield your collection from Ultron! 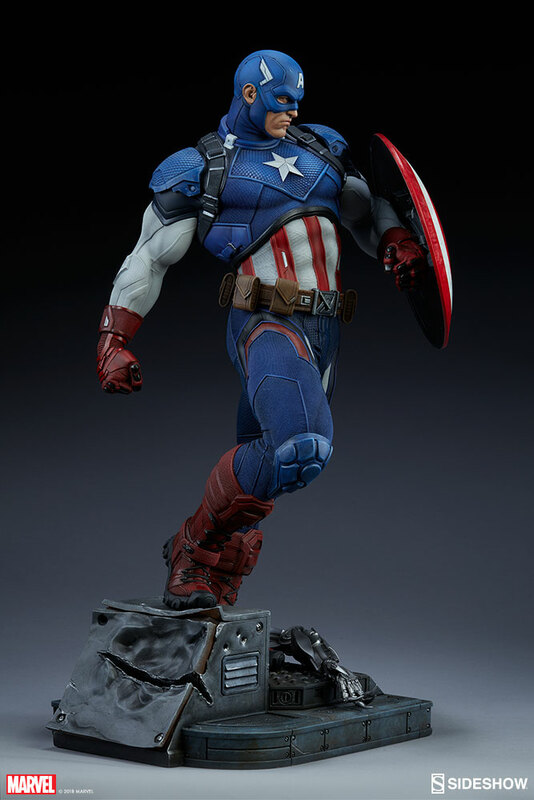 Pre-order the Captain America Premium Format™ Figure and add the star-spangled Avenger to your collection. 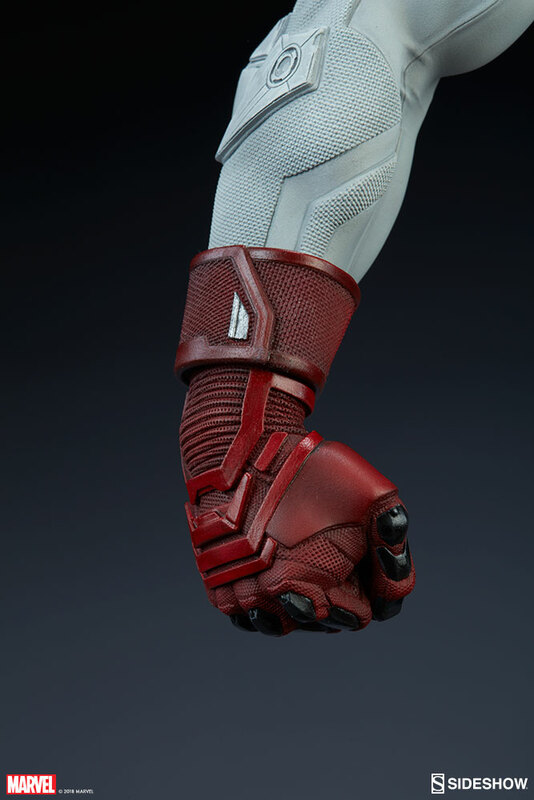 No fooling! 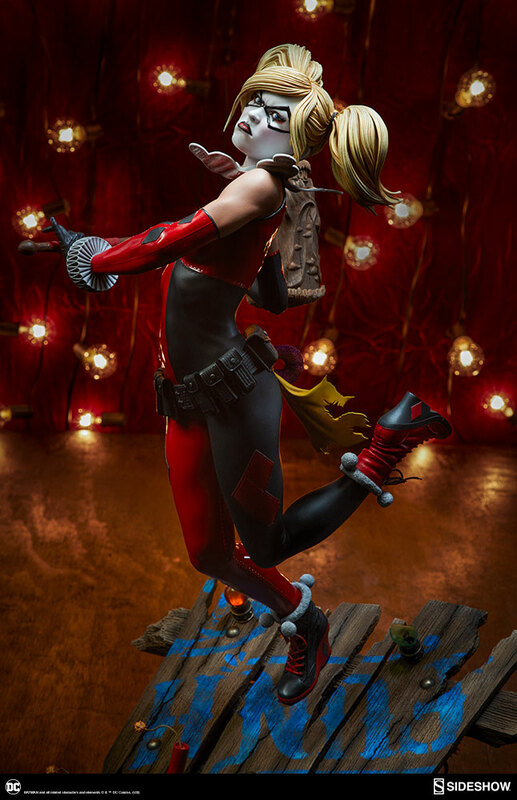 Sideshow is proud to present the Harley Quinn Premium Format™Figure, ready to paint Gotham red and black with her antics. 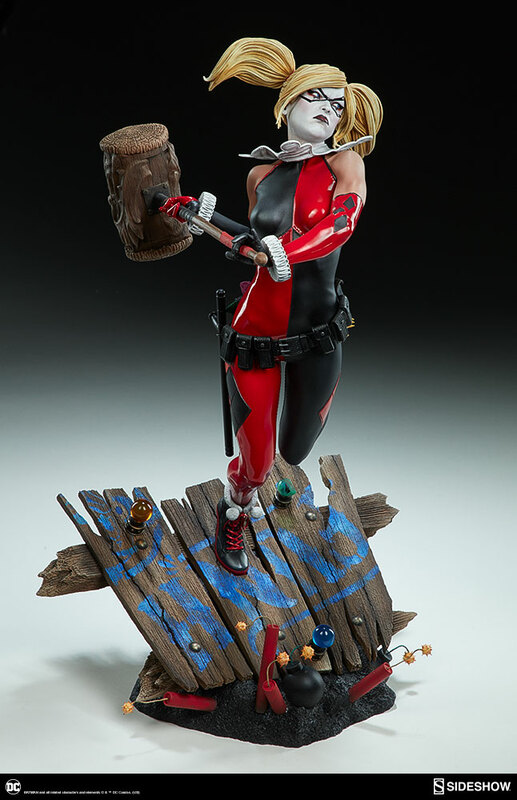 Harley Quinn measures 20” tall, leaping off a derelict funhouse base packed with gunpowder and crackling explosives. 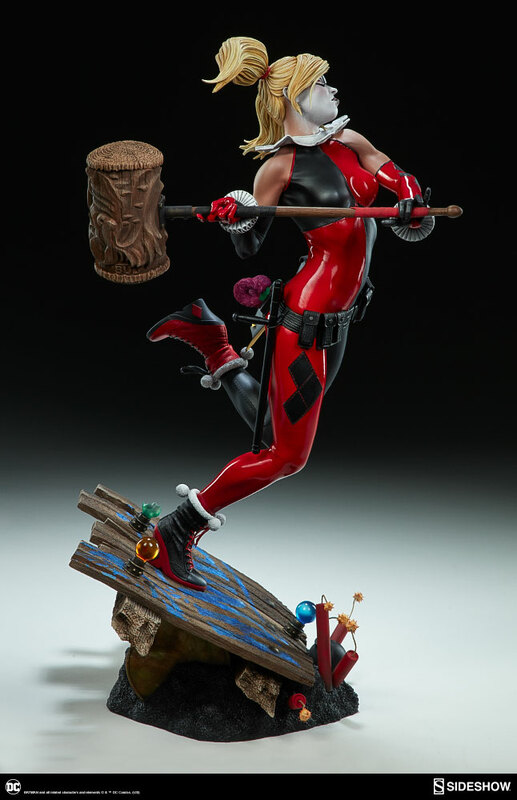 This resin figure has an entirely sculpted costume decked out with diamond patterns and frills, all in Harley’s signature red, black, and white style. 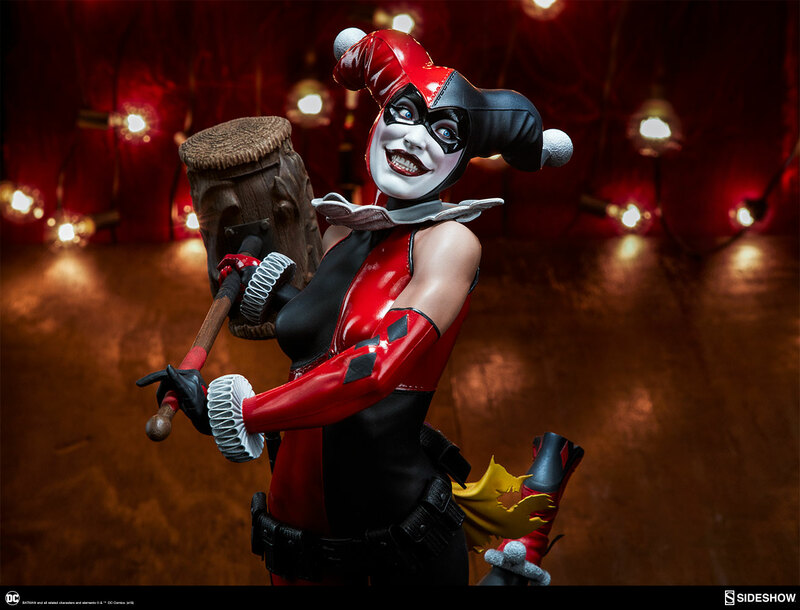 The Harley Quinn Premium Format Figure includes two interchangeable portraits so that you can display your favorite face of Gotham’s maid of mischief! 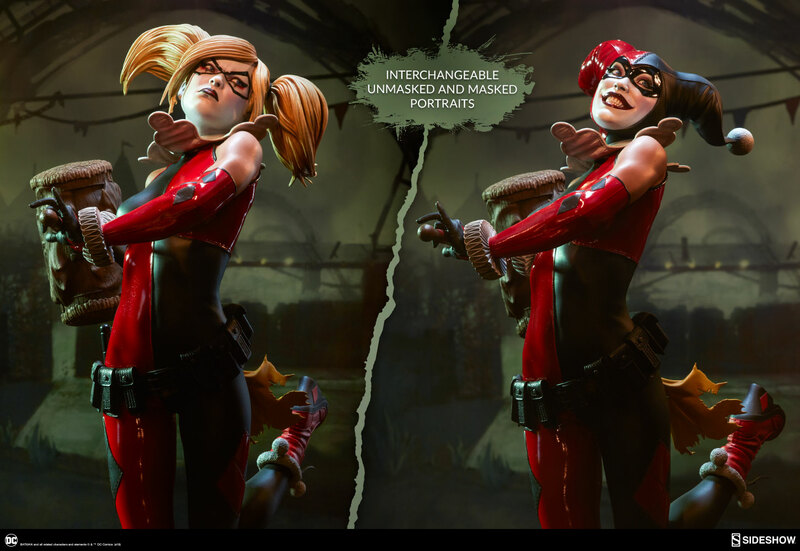 Her pouting unmasked portrait features her classic white makeup, a thin domino mask, and blonde hair pulled back into pigtails. 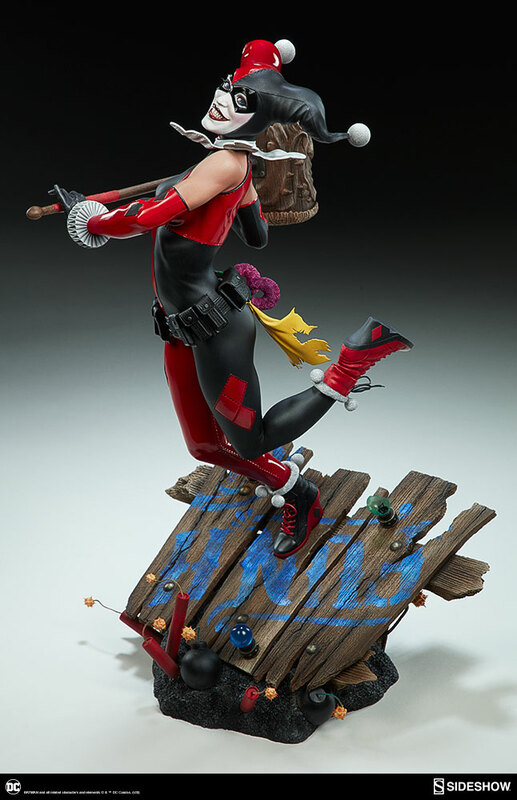 Her masked portrait features a gleeful grin framed by her iconic harlequin hood, white makeup, and domino mask. 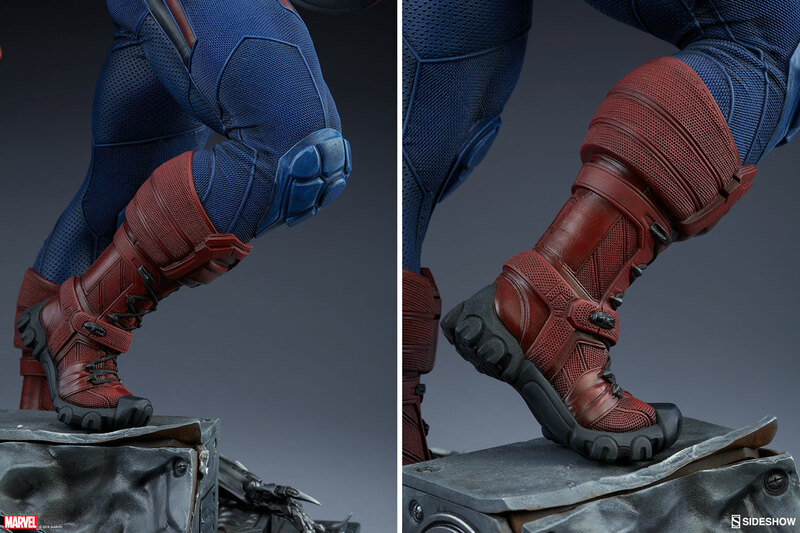 A girl’s gotta accessorize! 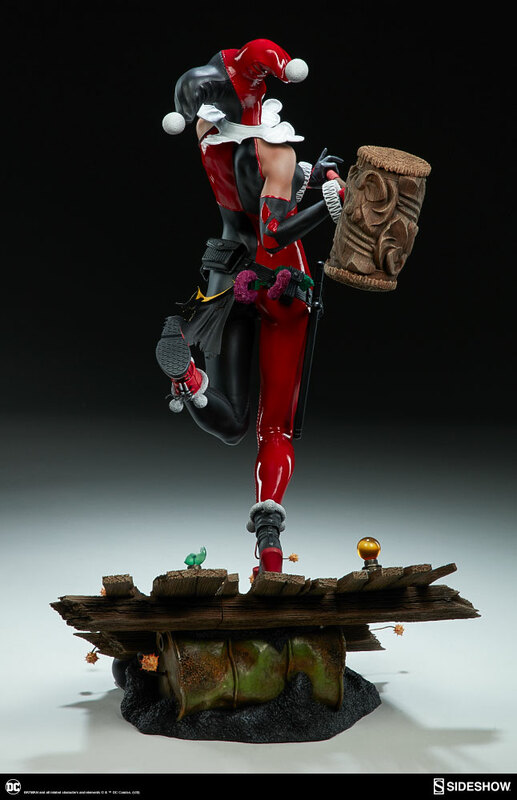 Harley Quinn is wearing a stolen Gotham PD utility belt complete with a nightstick, a pair of purple Joker cuffs, tatters from Robin’s cape, and a little green in her pocket courtesy of Poison Ivy. 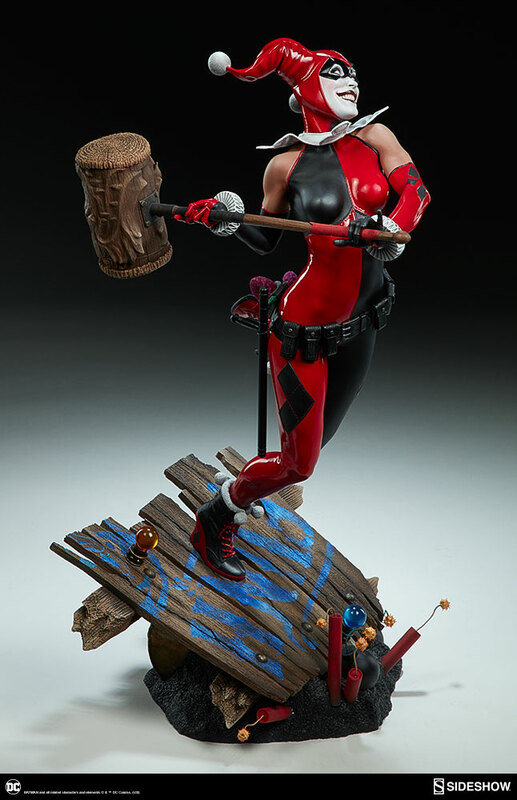 Harley is ready to crack a few jokes and a few skulls with her massive hammer, detailed with stylized portraits of her darling hyenas Bud and Lou. 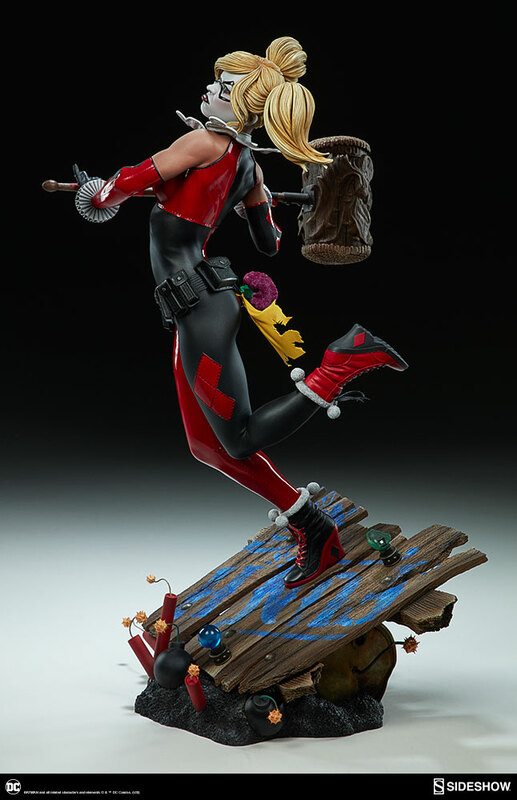 Put the ‘laughter’ back in ‘slaughter’ and add the Harley Quinn Premium Format™ Figure to your DC collection today! 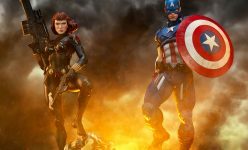 Tutti gli oggetti presentati in questa pagina: – Sideshow – Cap. 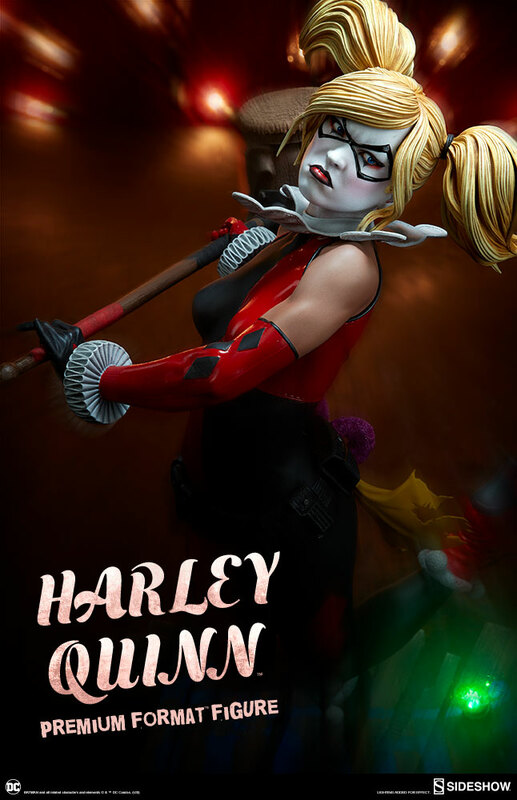 America & Harley Qinn PFs + Prime 1 – Studio Ciri of Cintra & King Kong – sono disponibili per ordini o preordini presso la Fumetteria Inchiostro & Tempera di Napoli. 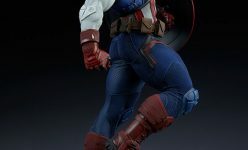 Sideshow presenta la nuova Captain America Premium Format™ Figure che sarà in preordine dal prossimo 22 Febbraio al prezzo di $570.00. 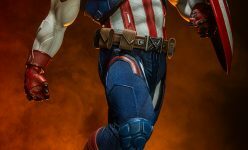 In attesa di conoscere la conversione del prezzo in Euro, seguitemi dopo il salto per l’ immagine sino ad ora disponibile. 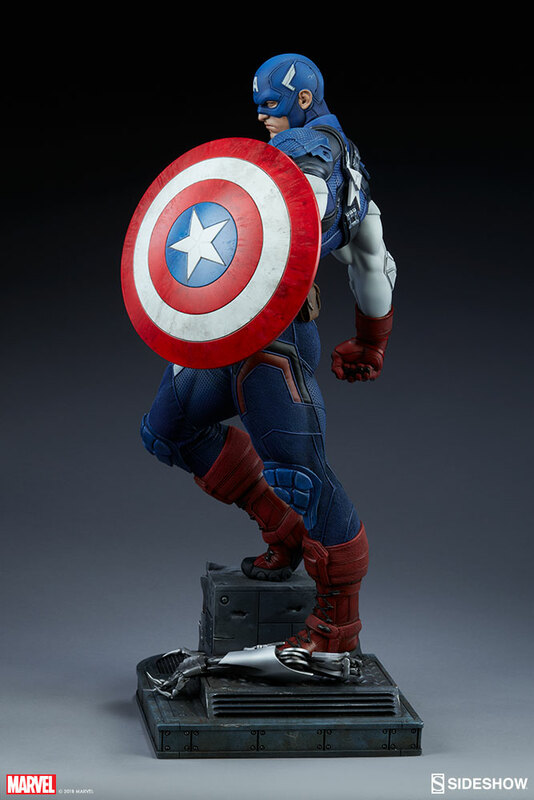 Shield Your Shelf With the Captain America Premium Format™ Figure! 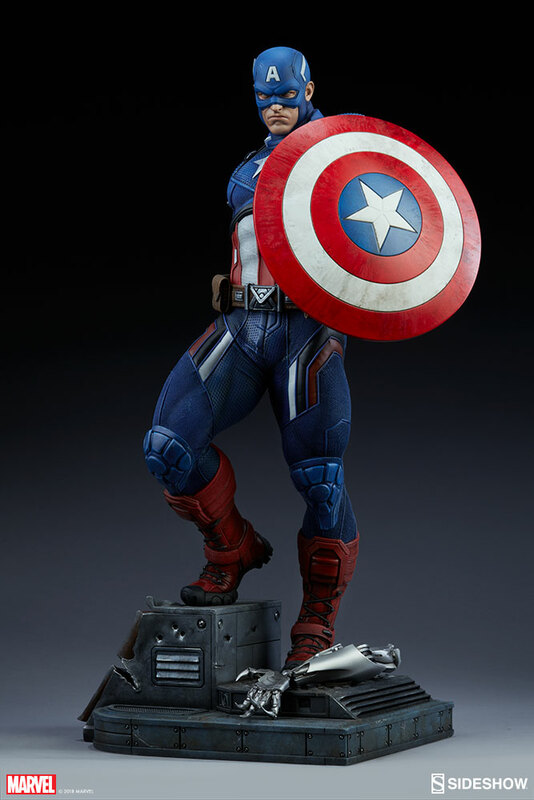 The Captain America Premium Format™ Figure measures 21” tall on top of a SHIELD Helicarrier platform, with a discarded Ultron Sentry arm littering the base beneath his red combat boots. 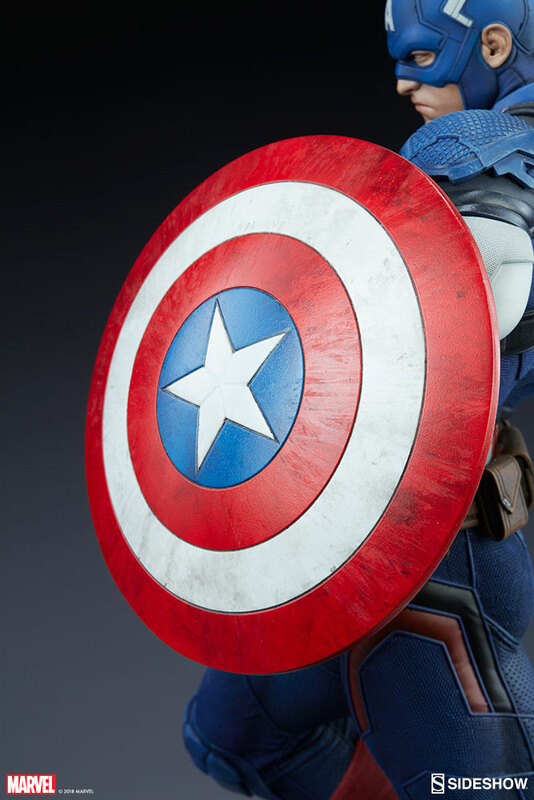 Cap’s iconic shield is raised and battle-worn while he takes a stand against Ultron and his armies. 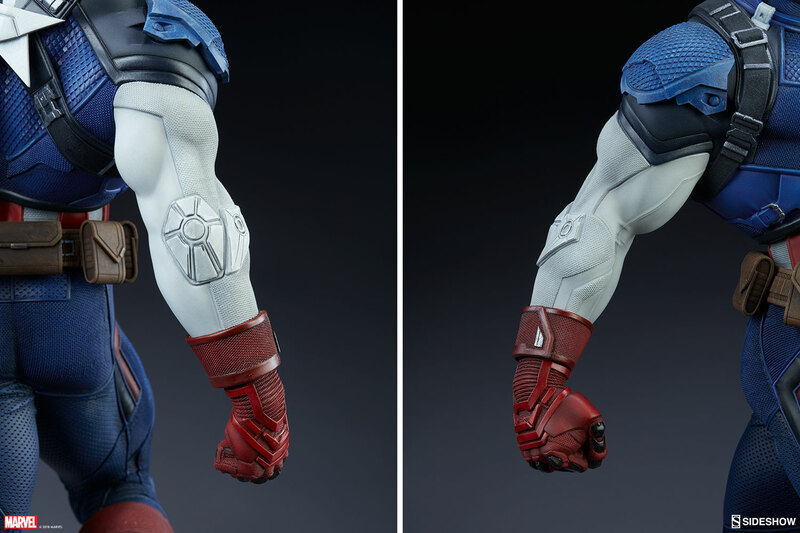 A robotic menace is no match for the strength of Captain America. 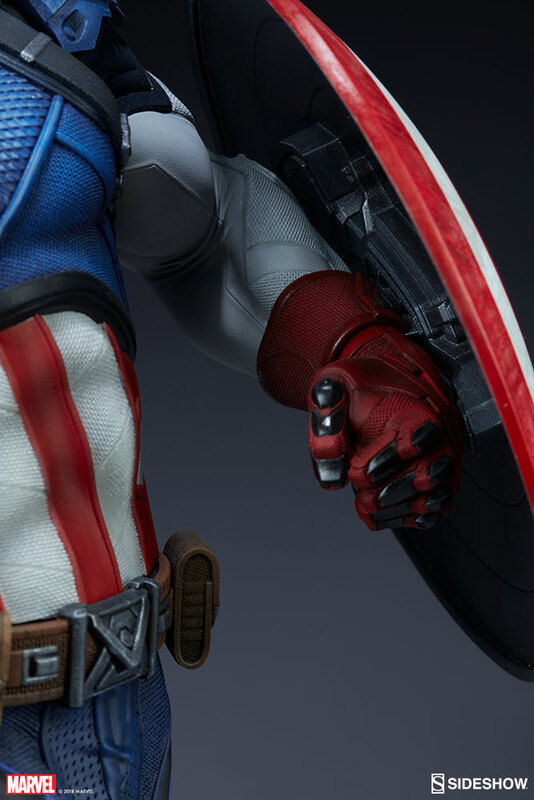 The Exclusive edition of the Captain America Premium Format™ Figure includes an alternate right hand clutching an Ultron Sentry Head. 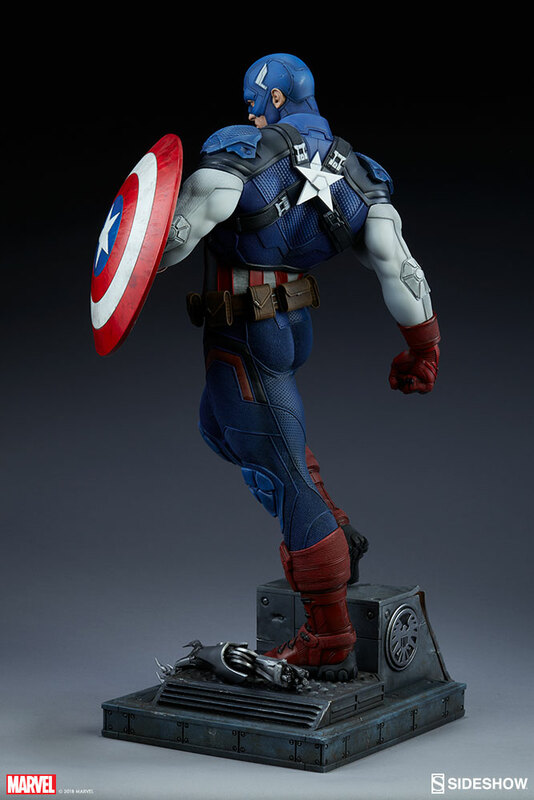 Pre-orders for the Captain America Premium Format™ Figure will begin on Thursday, February 22nd between 12pm-3pm PST. 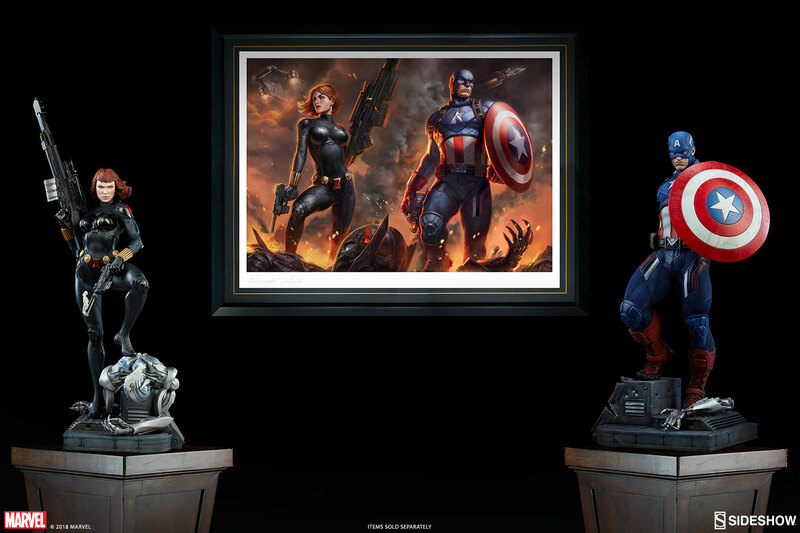 The Exclusive edition will be priced at $585.00 and the Collector edition will be priced at $570.00. 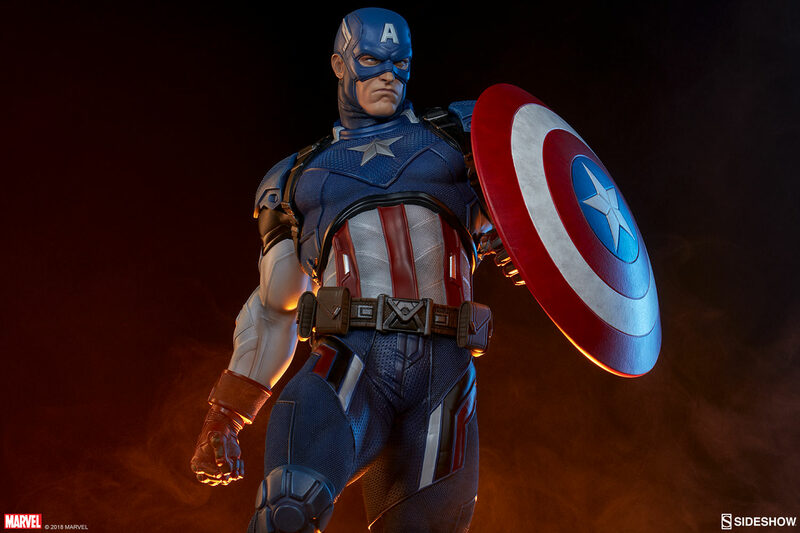 Tutti gli oggetti presentati in questa pagina: – Sideshow – Captain America Premium Format™ Figure – sono disponibili per ordini o preordini presso la Fumetteria Inchiostro & Tempera di Napoli.